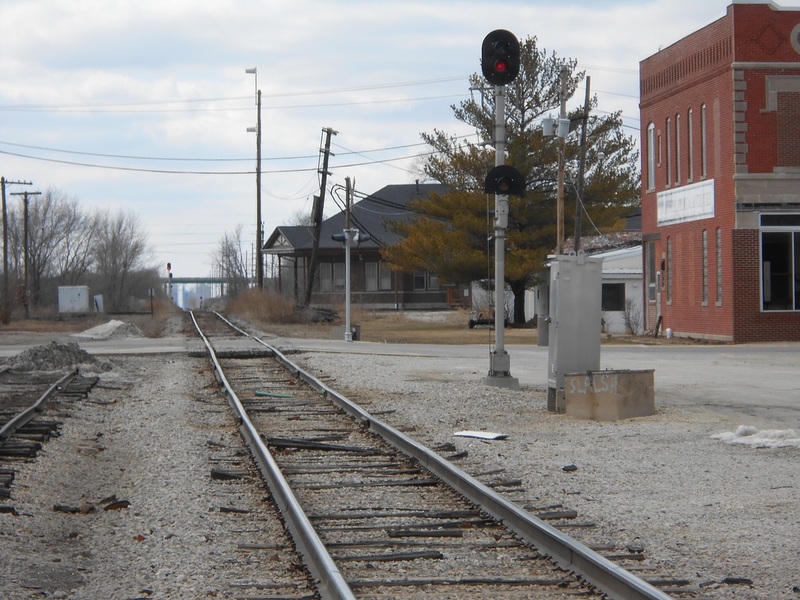 It wasn't long for a town to form when US-24 and US-45 run through the town, along with the Illinois Central mainline to New Orleans railroad having a major junction with the Toledo, Peoria, and Western Railroad in downtown. 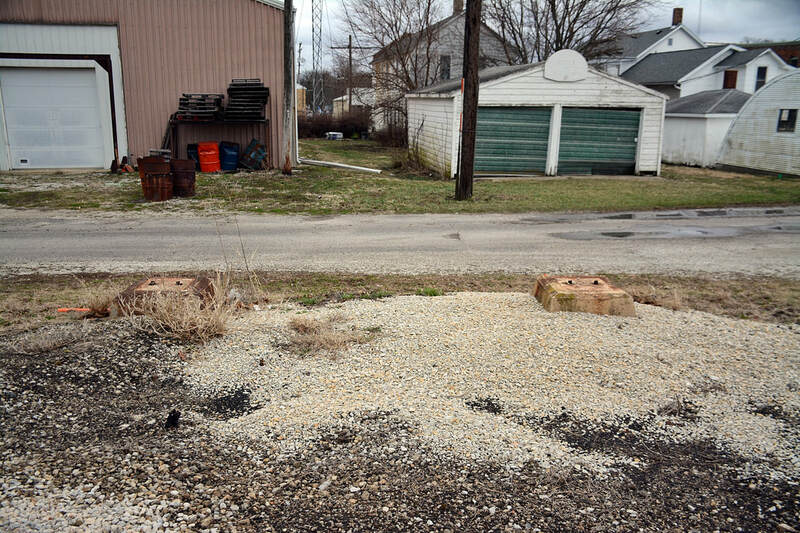 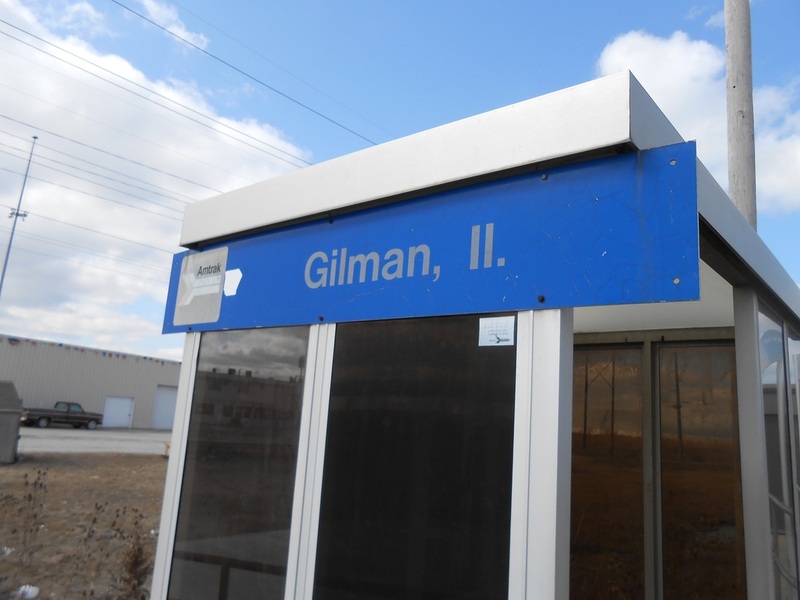 It is true, Gilman is a large town among the many that sprung up - yet it has yet to reach the height of Kankakee. 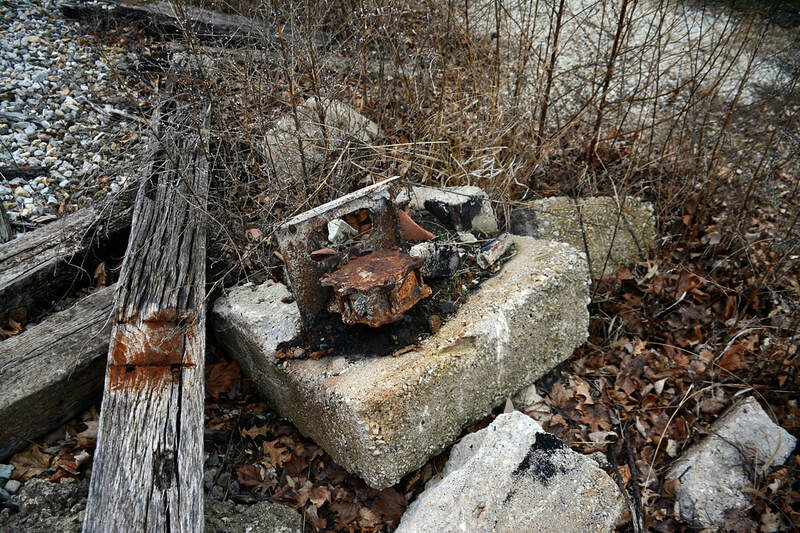 Likely may never catch up. 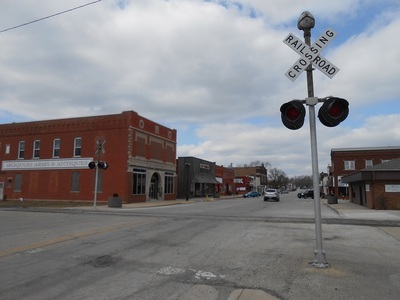 Nonetheless this town of the crossroads has a great purpose if we talk railroad wise. 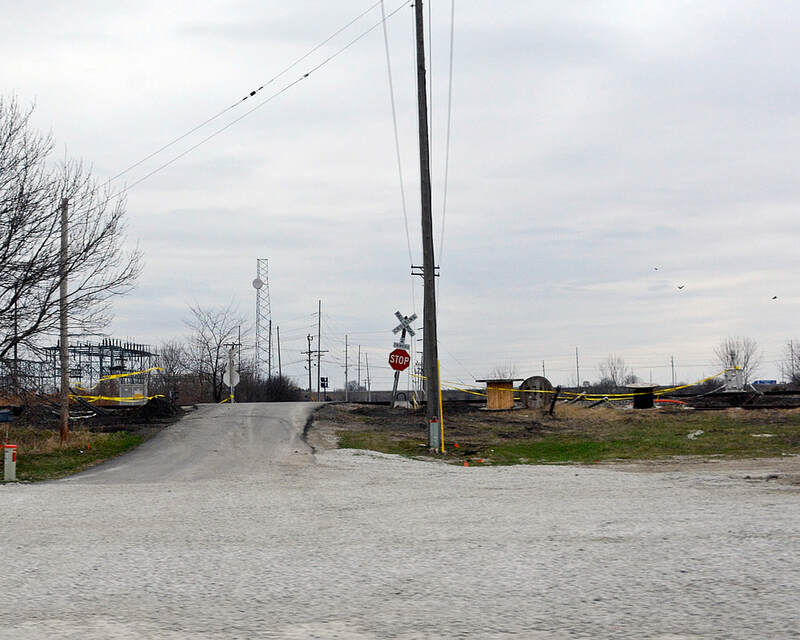 Incobrasa Industries makes a huge presence, the Gibson City line also funnels into the Chicago Sub here. 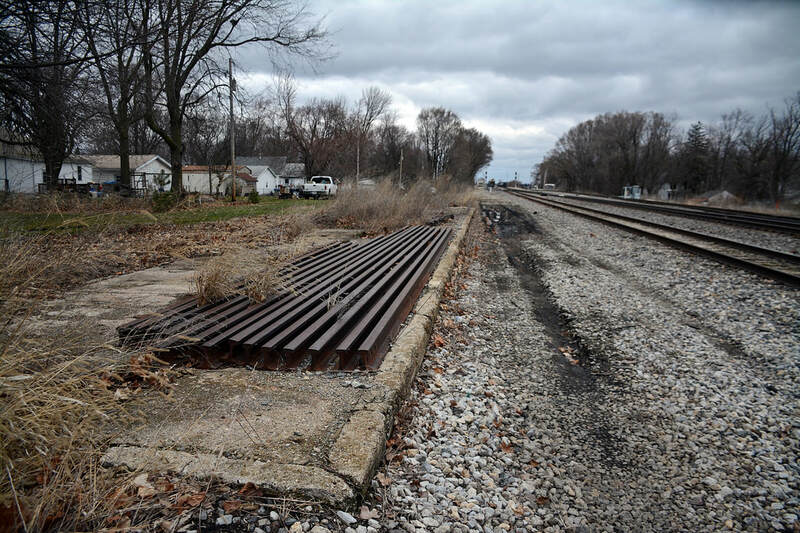 It comes in from the southwest and heads north into the Chicago Sub. 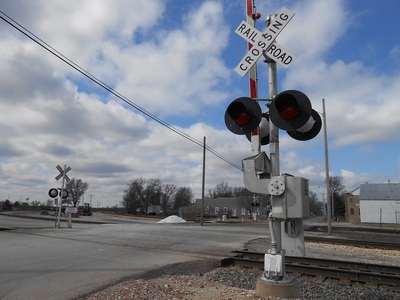 Today, it remains an active railroad location despite suffering from the Illinois Central scale back in track and signals and having the TP&W dropping out from its heyday... things could be on the verge of building back up however. 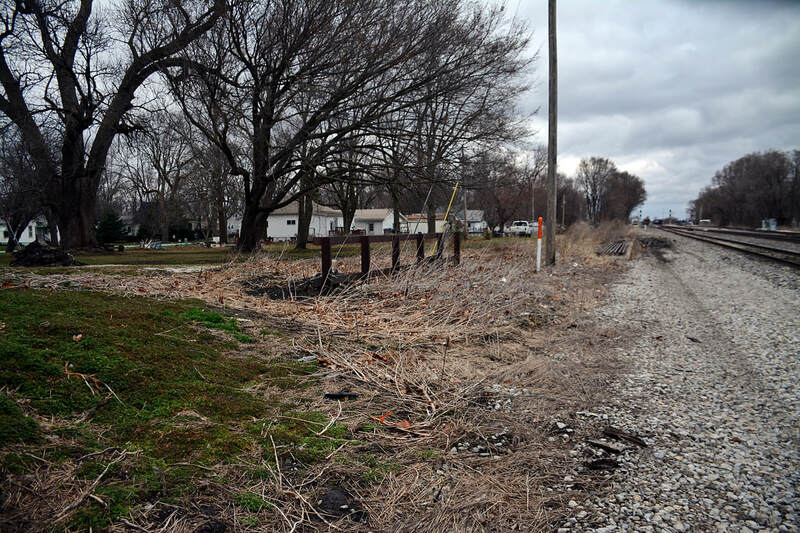 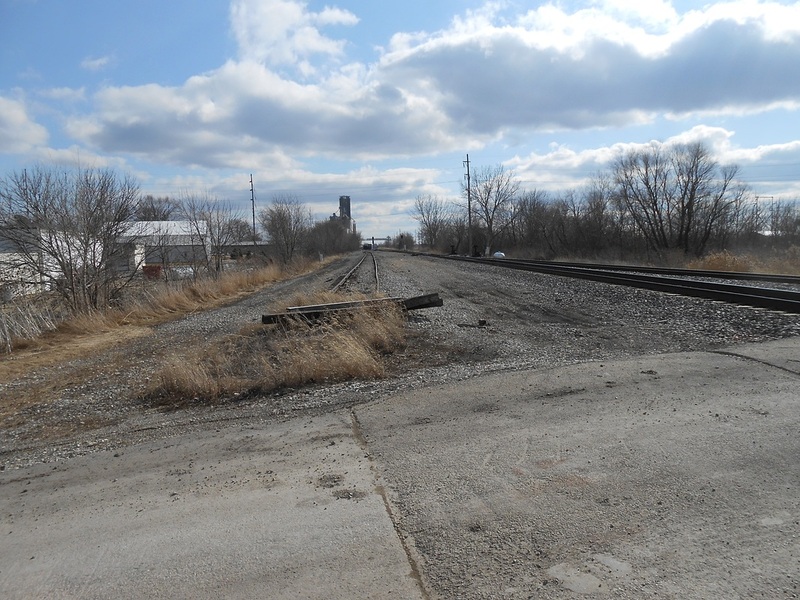 With improvements to the TP&W under G&W ownership and new traffic on the CN line, this spot could become busier. 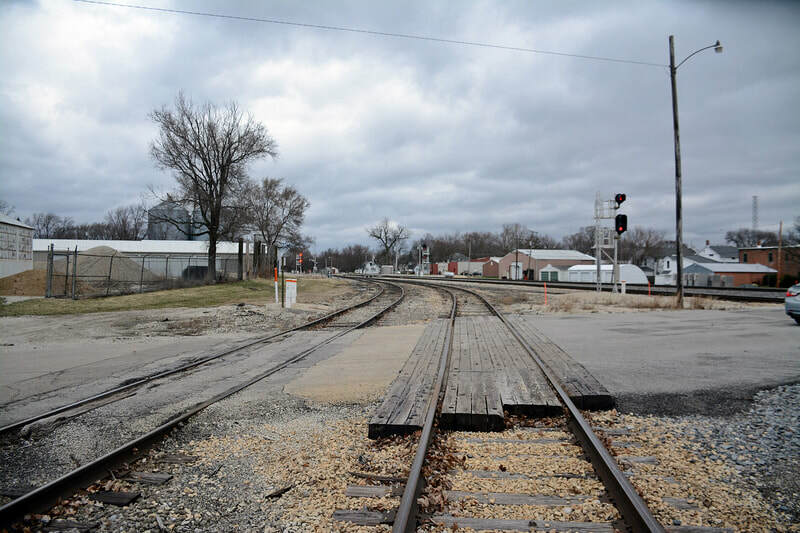 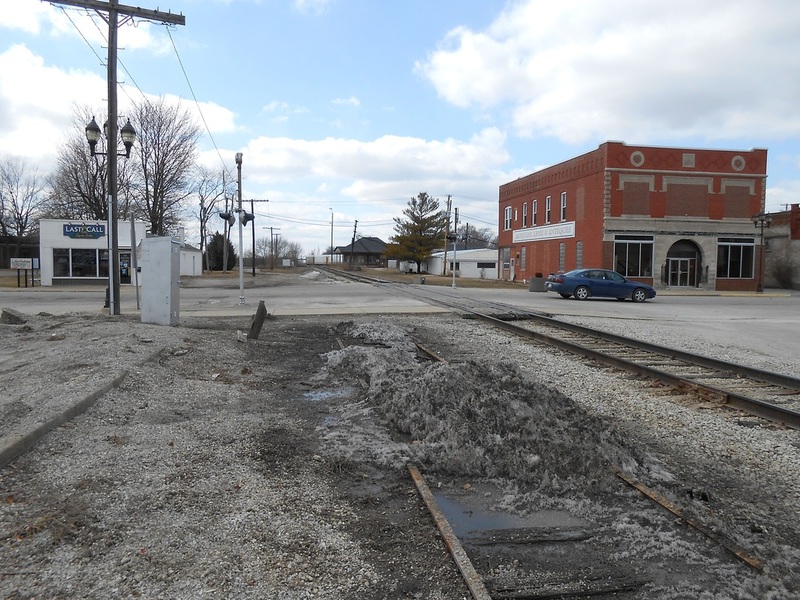 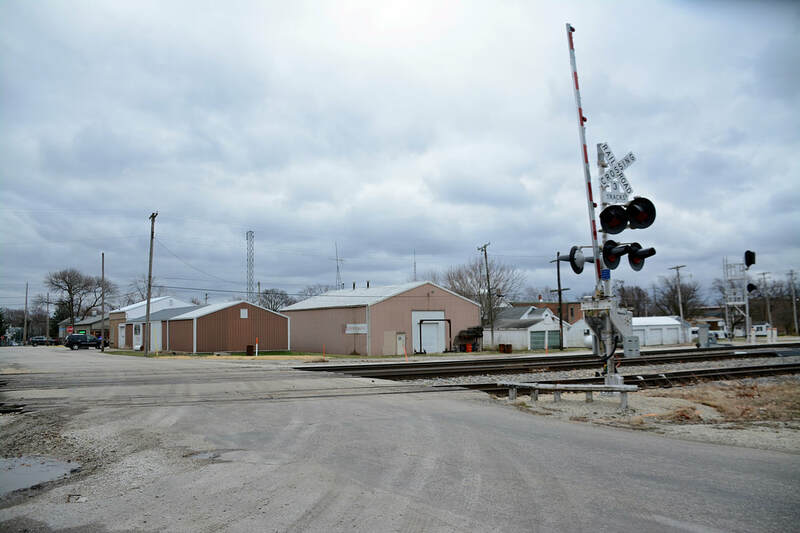 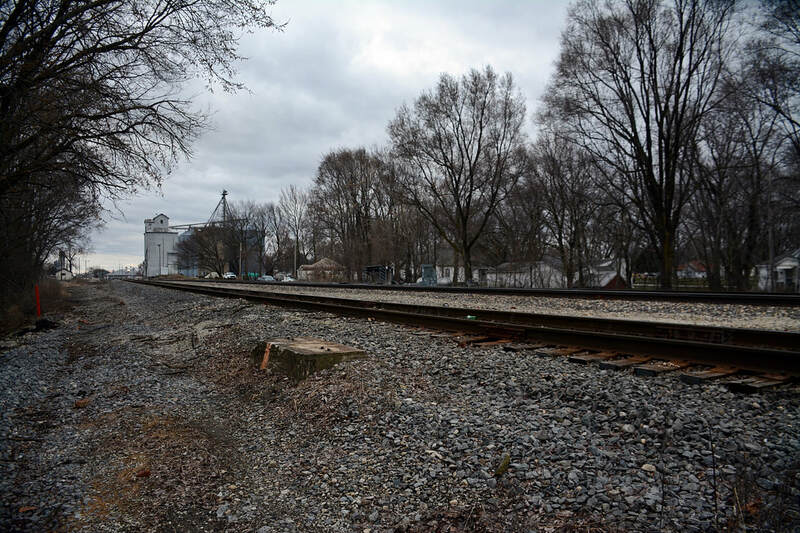 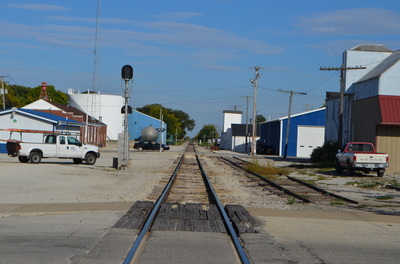 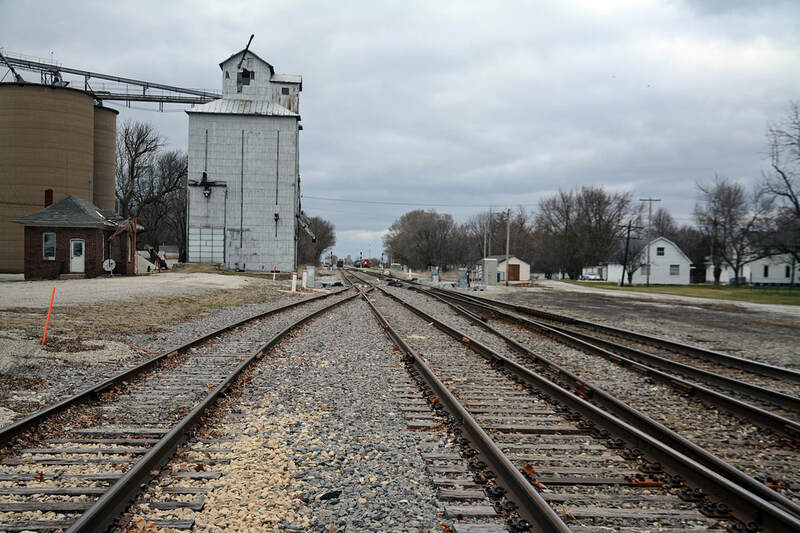 The Illinois Central railroad has a yard north of downtown Gilman. The yard also featured steam servicing facilities. The coal towers still stand to this day, but lack features once sported including an overhead conveyor? 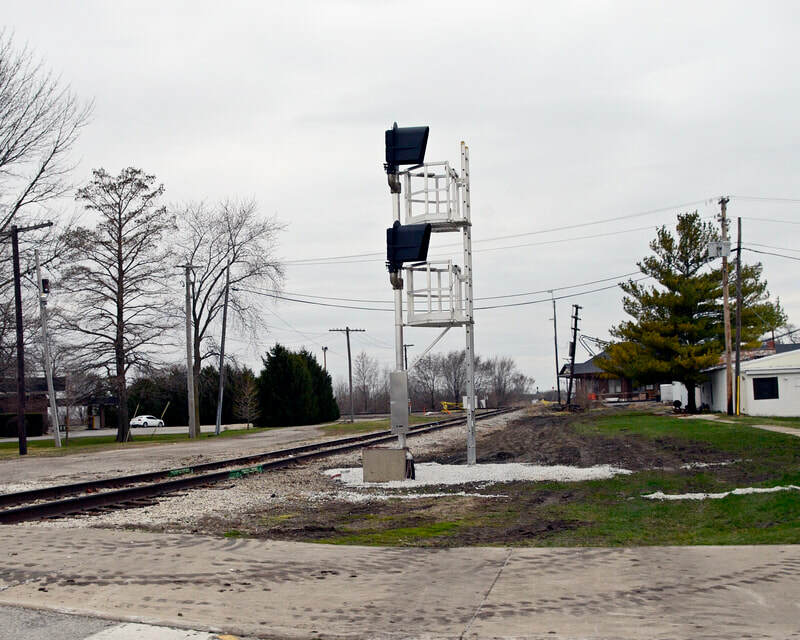 The town also had a few signal gantries as did all towns on the Illinois Central. 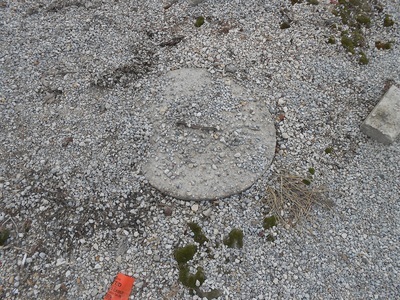 One was north of the coaling towers south of East 2000 Road. 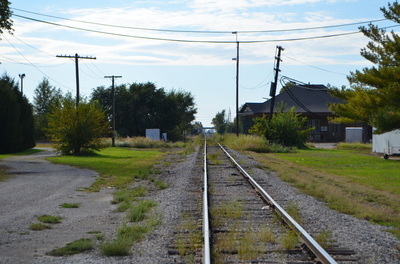 Two more stood south of 6th Street. One immediately south off of 3rd Street crossing. 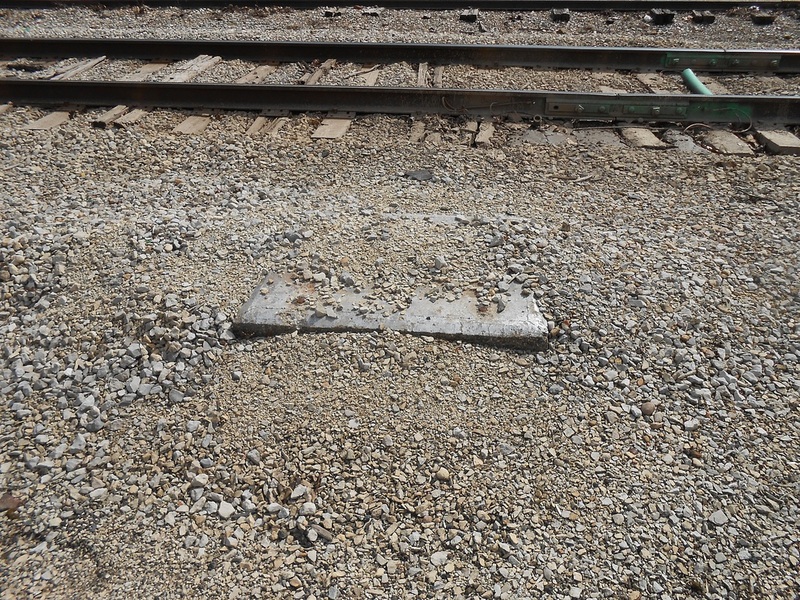 All gantries have since been removed. 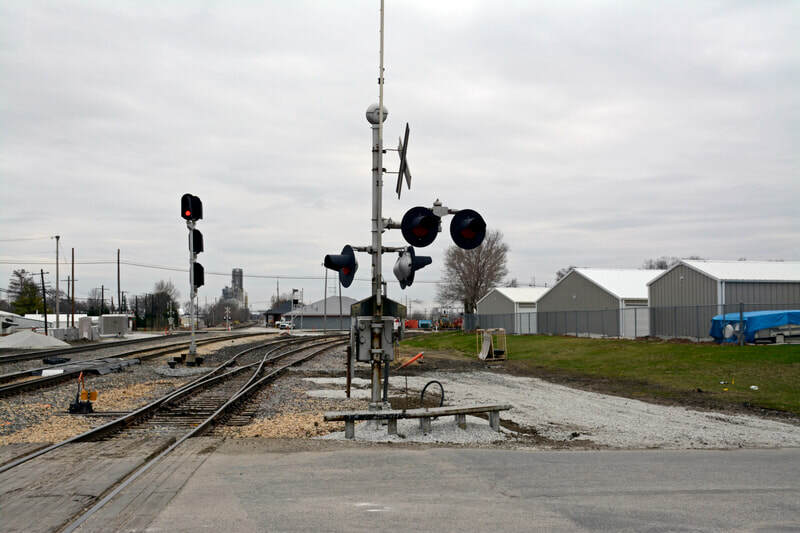 The downtown ones have been replaced with wayside signals recently. 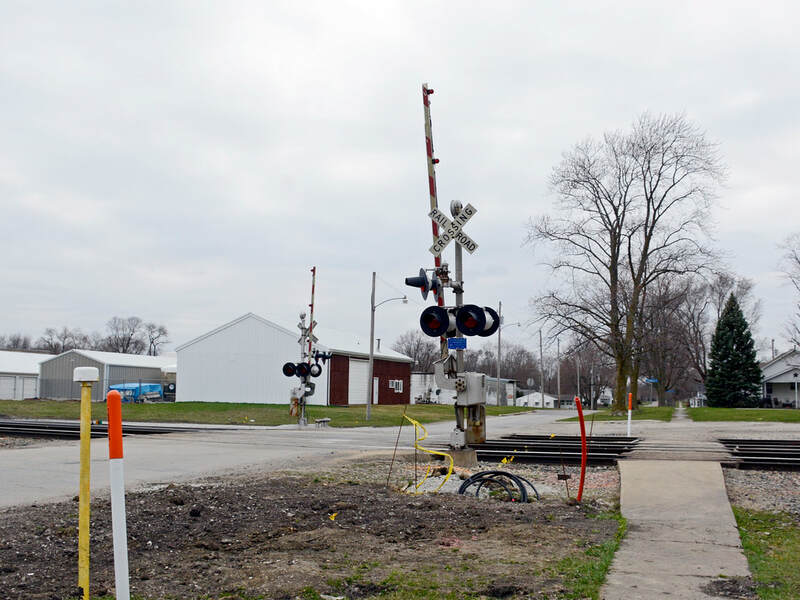 They lasted into the CN age, while the one north of town was taken down during the re-signalling during the "Death Star" era of the Illinois Central. 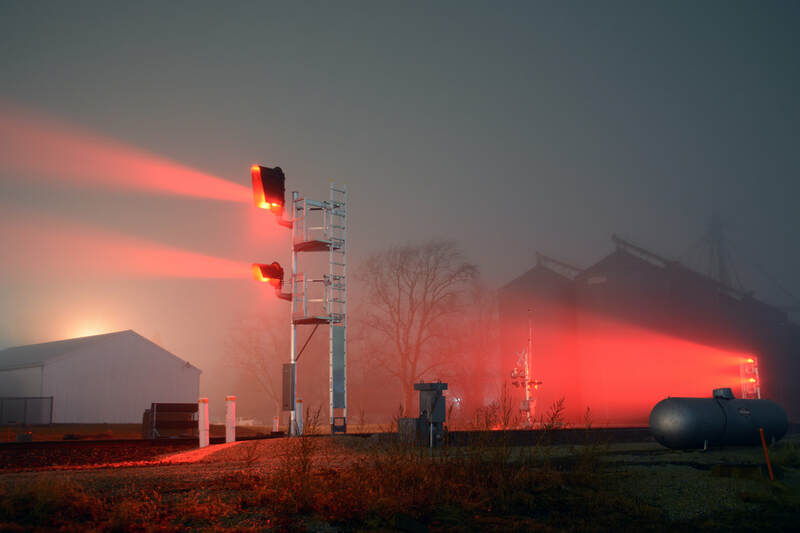 (cira 1980s) Two grain elevators command attention. A small one north of town seems to be an original with the dated design of the elevator. While a much bigger one resides just shy of US-24. 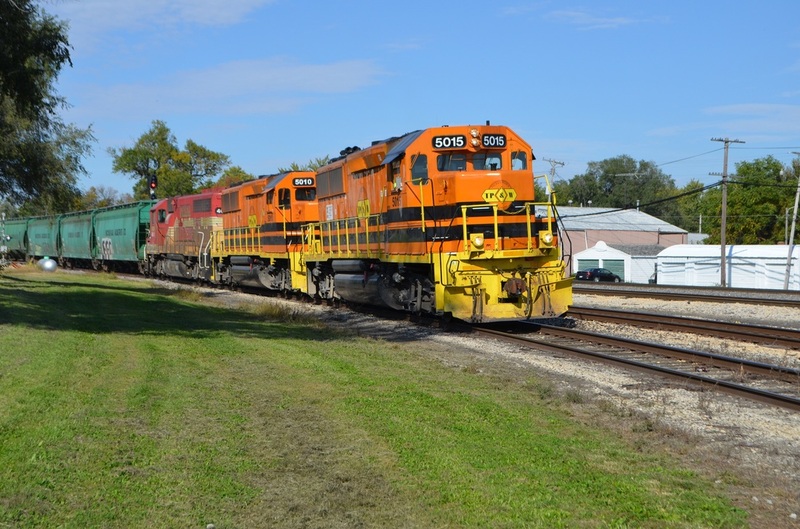 This one is much bigger and has an old repowered ALCO locomotive for switching. 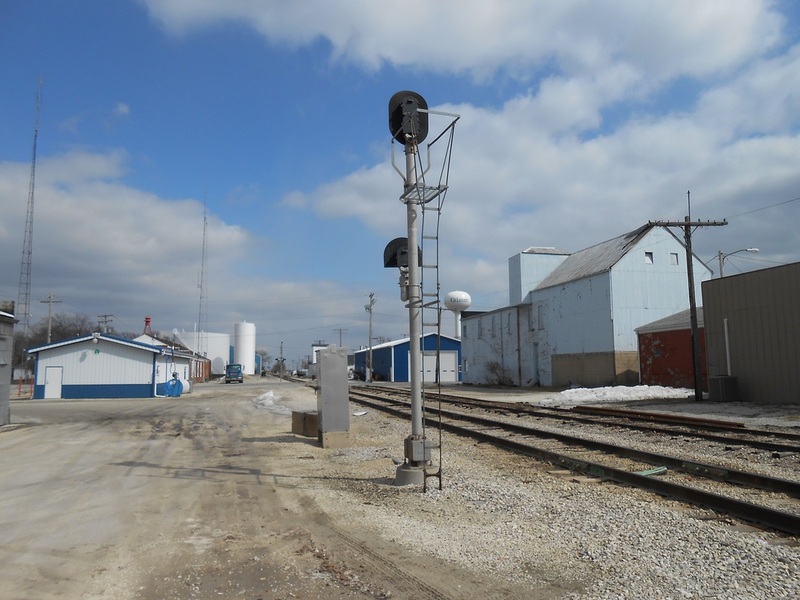 Incobrasa Industries has a large factory that is mostly serviced by rail. 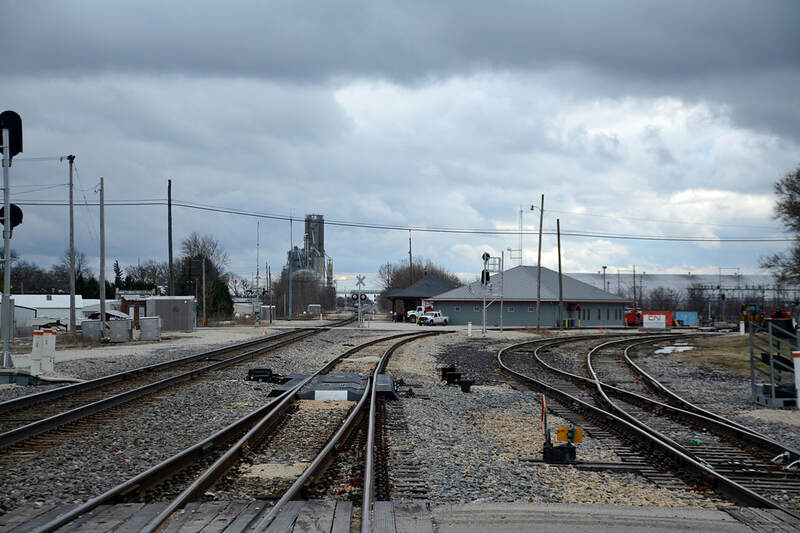 TP&W and CN both service this industry. The TP&W railroad runs east and west through Gilman making interchange connections with the Canadian National Chicago and Gilman Subdivisions. The TP&W is currently run and operated by Genesee & Wyoming Incorporated. 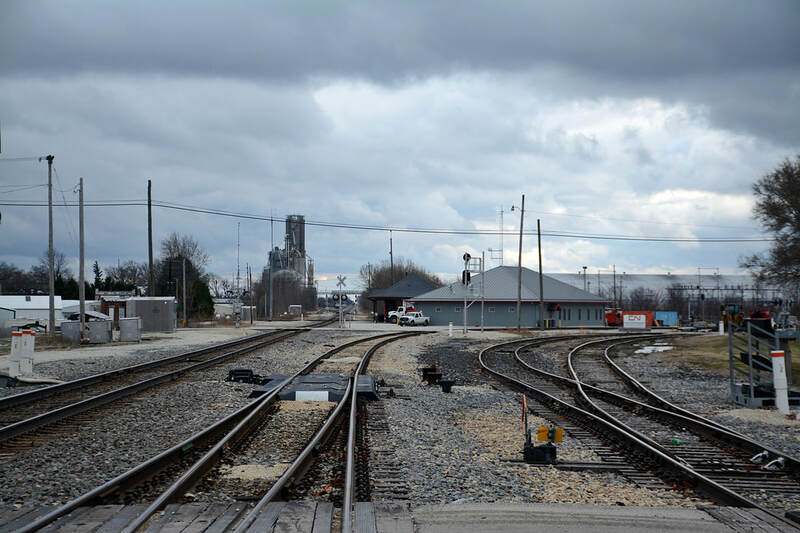 TP&W and CN both share Incobrasa Industries as a customer. 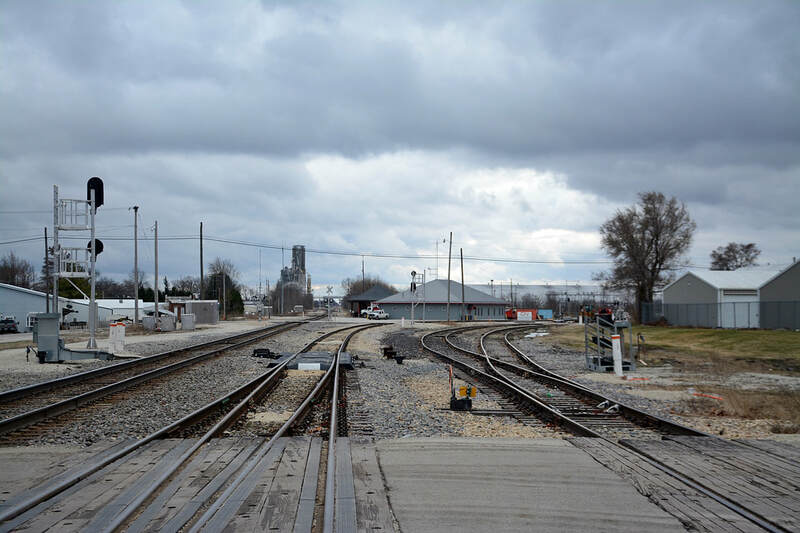 Canadian National has control over the interlocking. 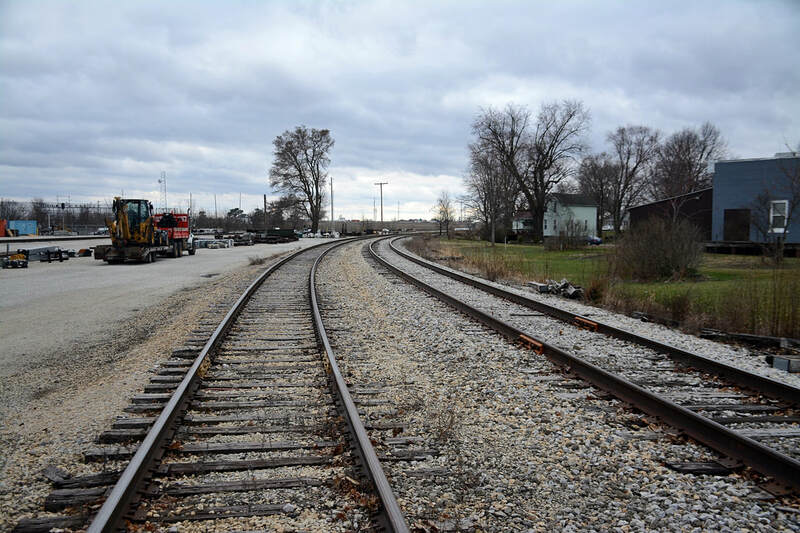 TP&W used to have passenger train service to Gilman, which stopped well before Amtrak years. 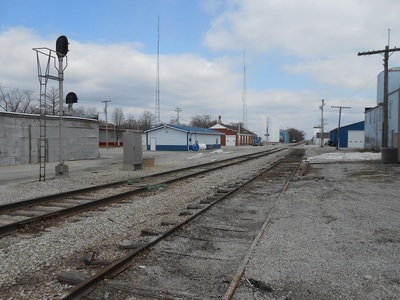 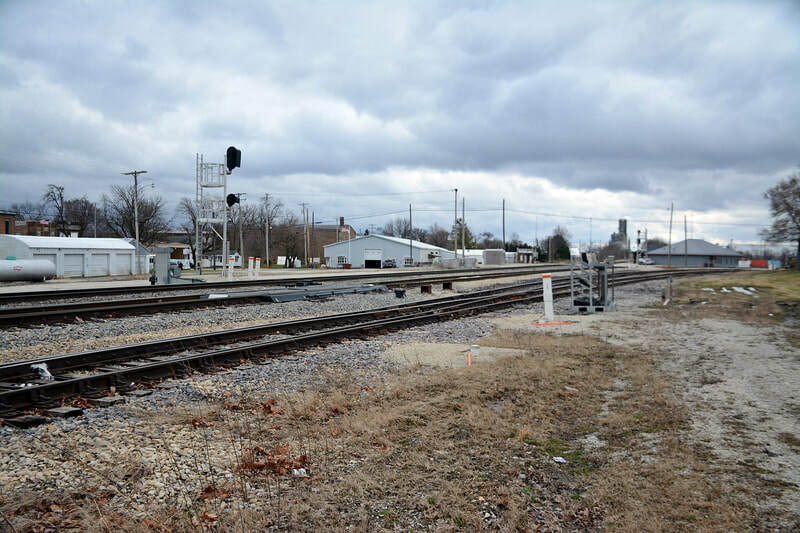 The depot located in the northwestern corner of the junction diamond was shared by ICRR and TP&W. 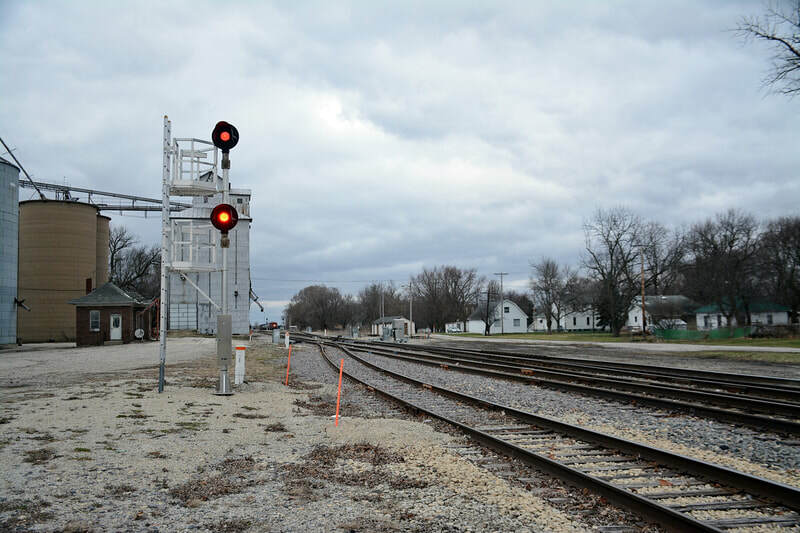 The original time I went around and documented these crossings was some time ago. 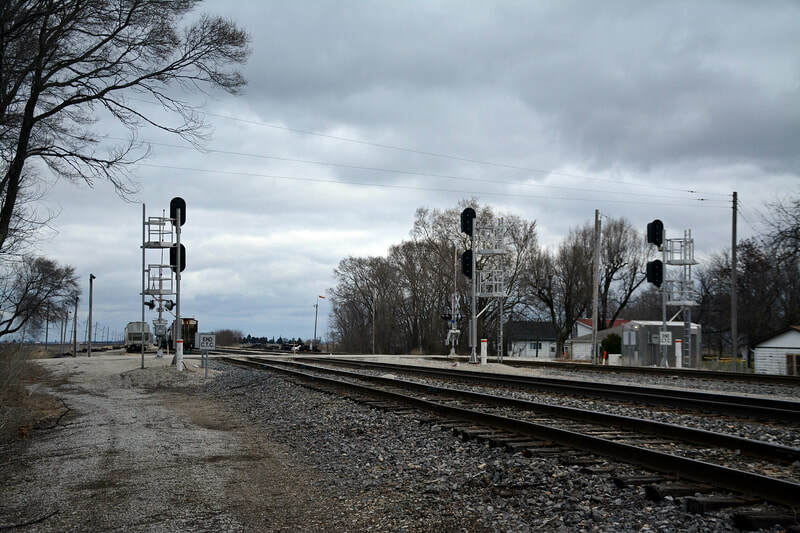 Since then, CN has come by and replaced a lot of the signals and I have included updated images below to reflect this. 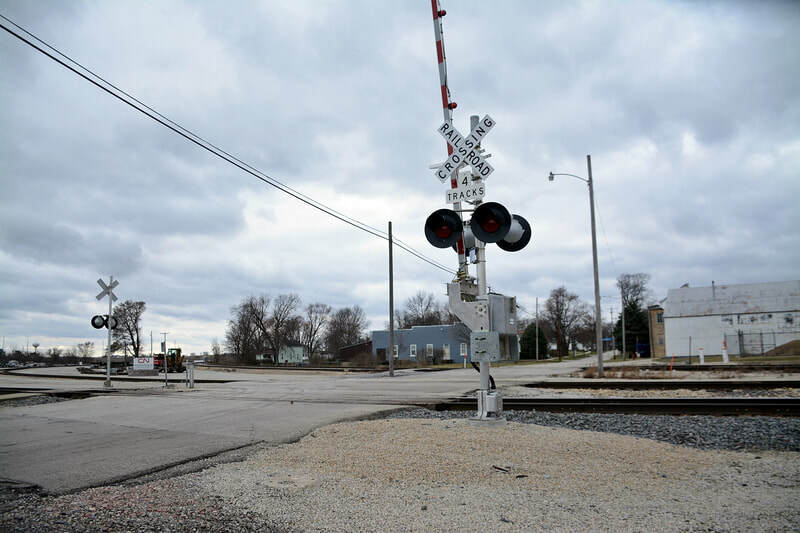 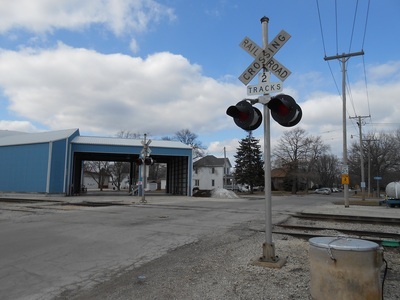 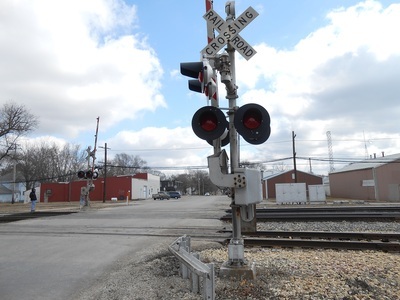 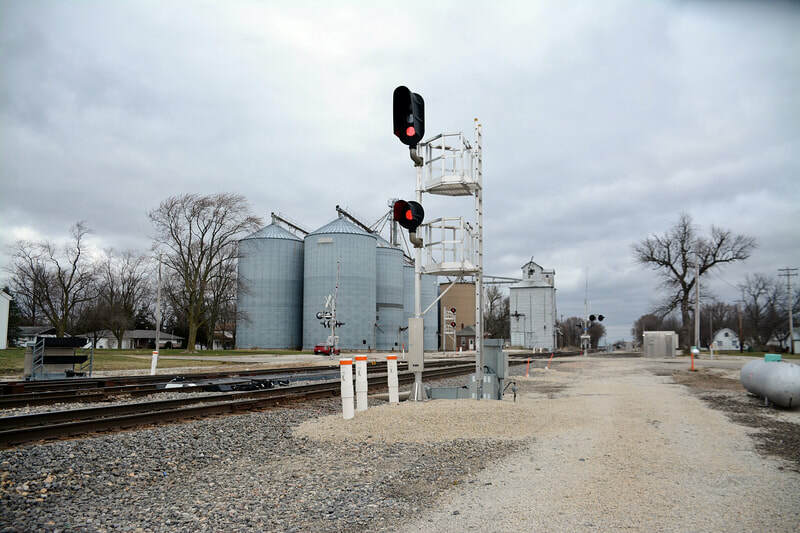 This crossing is also the entrance to the CN Engineering Department located in Gilman, IL. 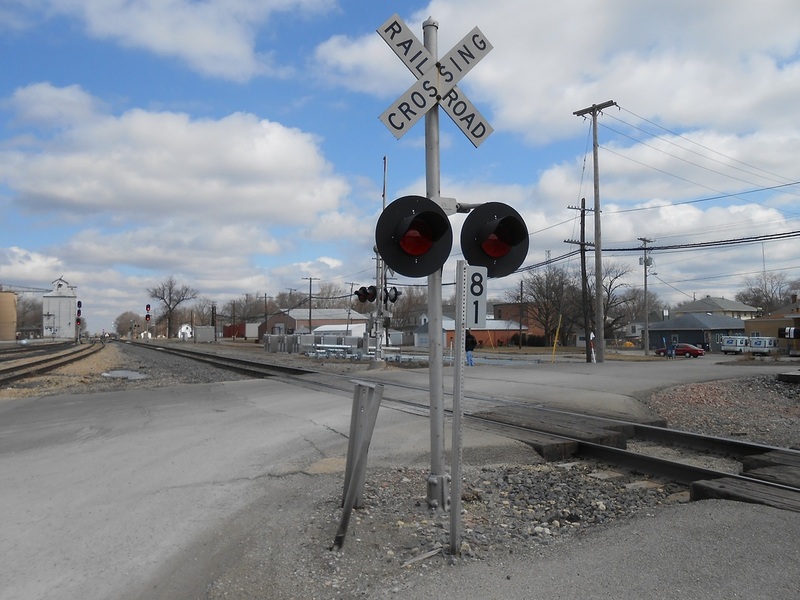 This crossing has since been upgraded. 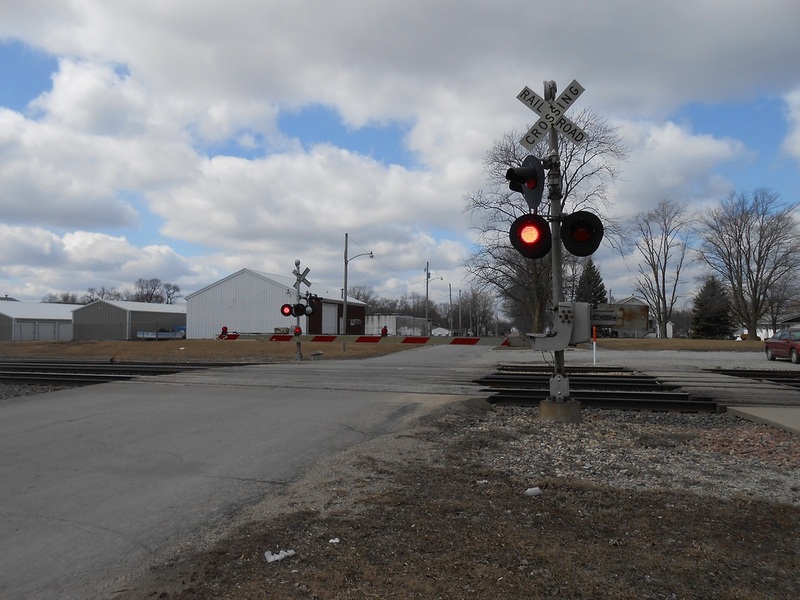 This crossing now has lights, bells, and gates. 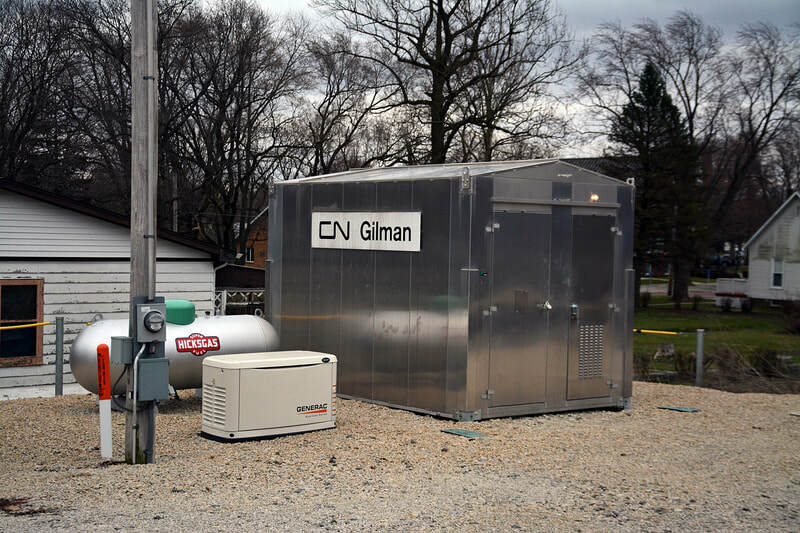 It access a farm and the substation only. 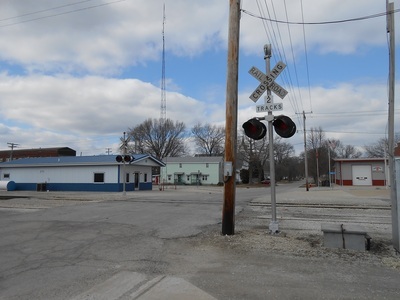 Only other crossing in downtown Gilman... it is right next to the northern elevator. This crossing has since been upgraded and replaced. 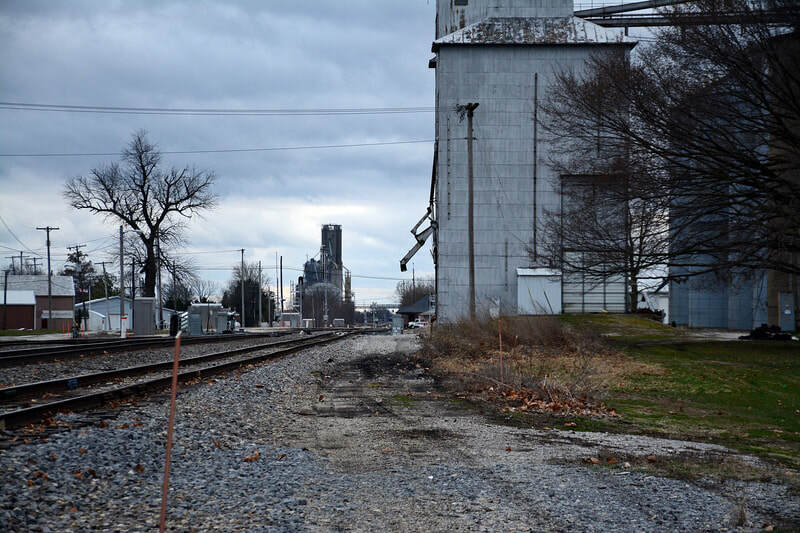 The elevator has since been torn down as well. 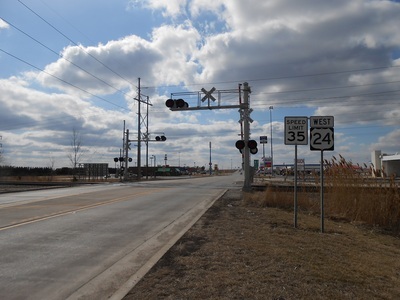 First grade crossing of the Gilman Subdivision heading southwest out of the junction. This shot shows the Gilman local turning a train around on the wye, coming down enough to activate the crossing. 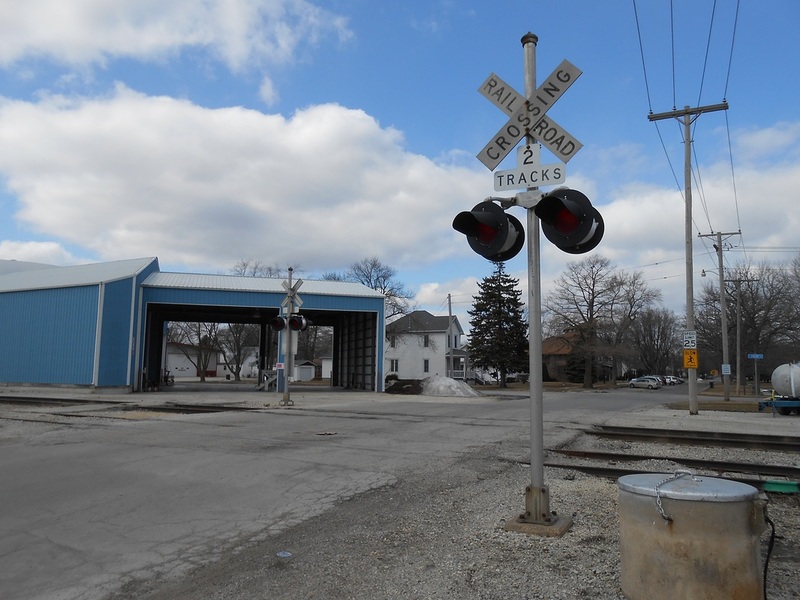 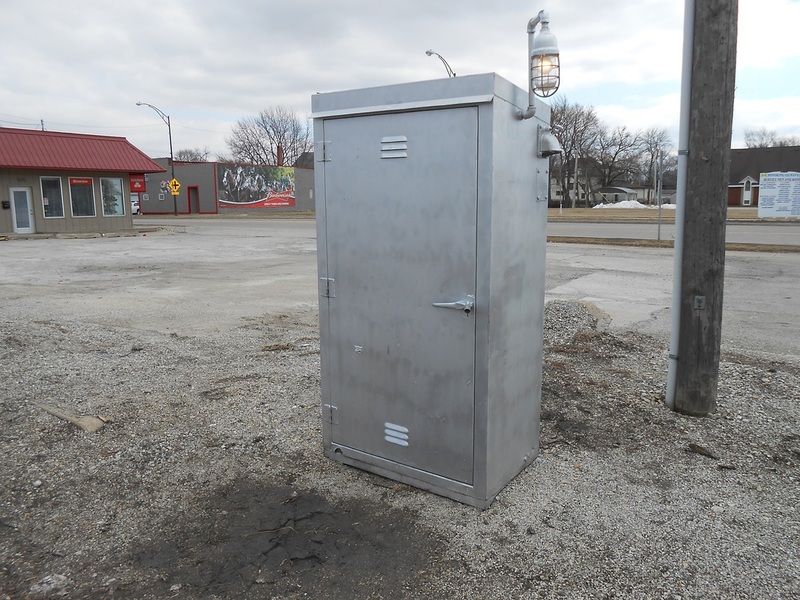 Below are images of the second signal rehab in Gilman, IL. These signals (with the exception of the dwarf LED 2 light) have been replaced with a different arrangement. 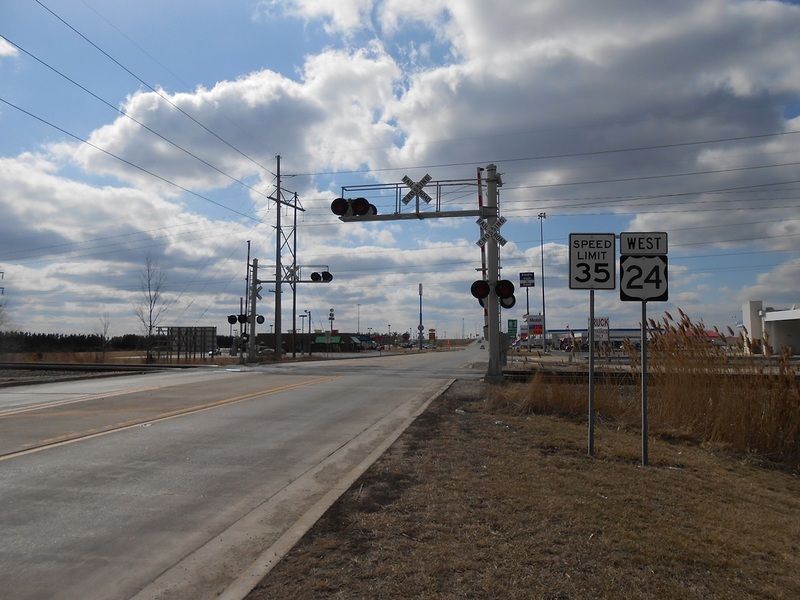 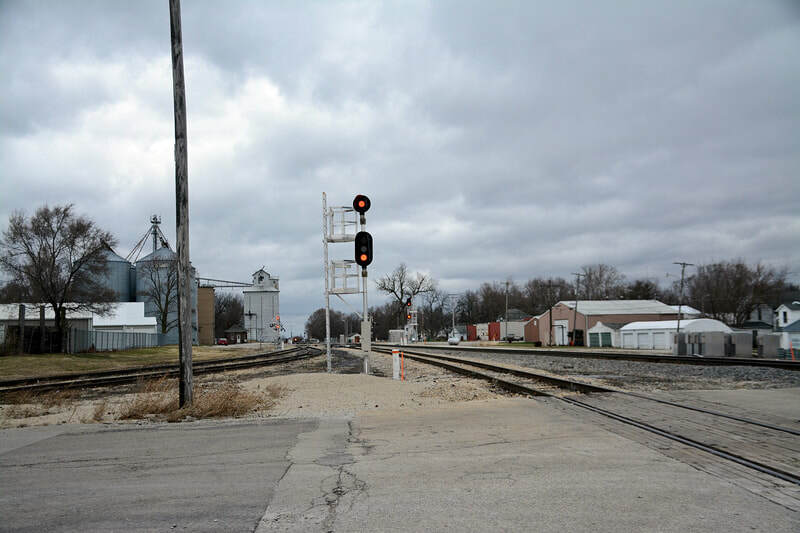 Previously, Illinois Central used three gantries to display the US&S Tri-light and Color-Light signals which governed junction routing via CTC. 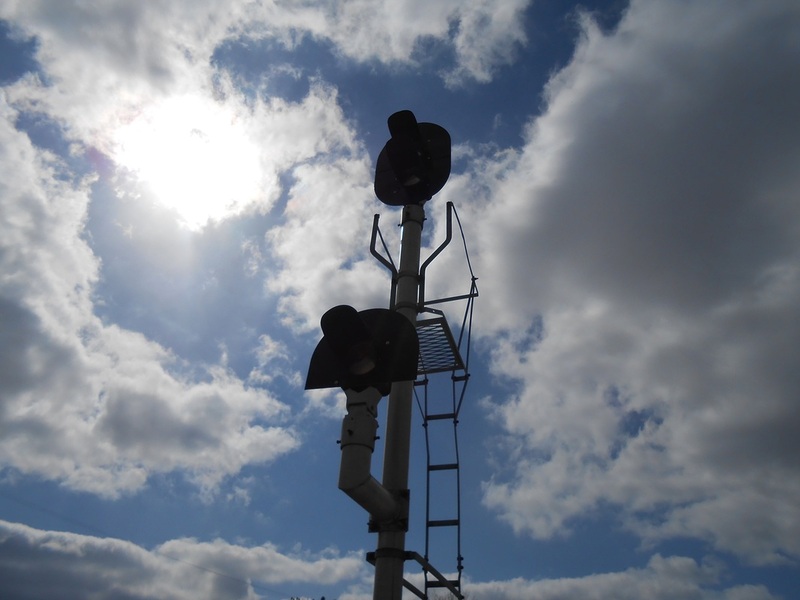 The new installation has signals at a similar design, having the signals lined up at points, but at wayside rather than gantry still controlled by CTC. 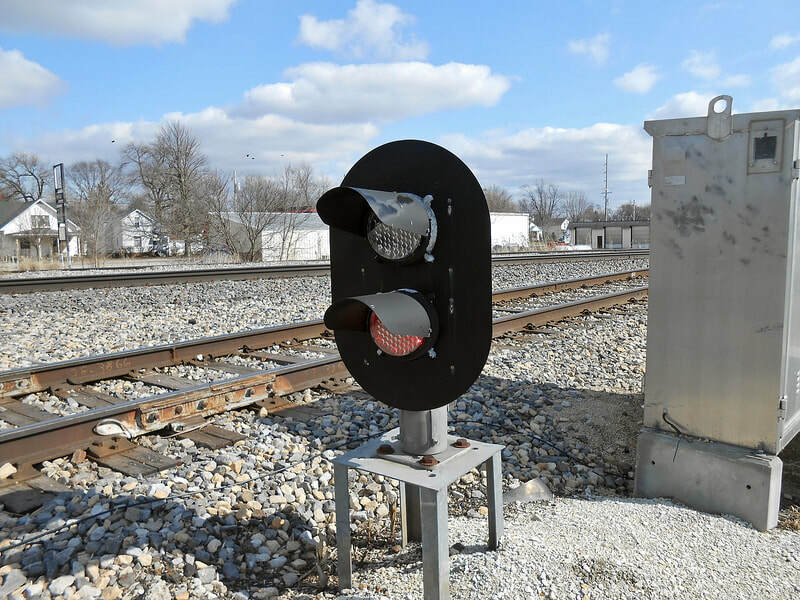 These links will show you the dwarf signals that controlled the switching lead and the overhead gantry tri-light signals that used to watch over mainline and through traffic. 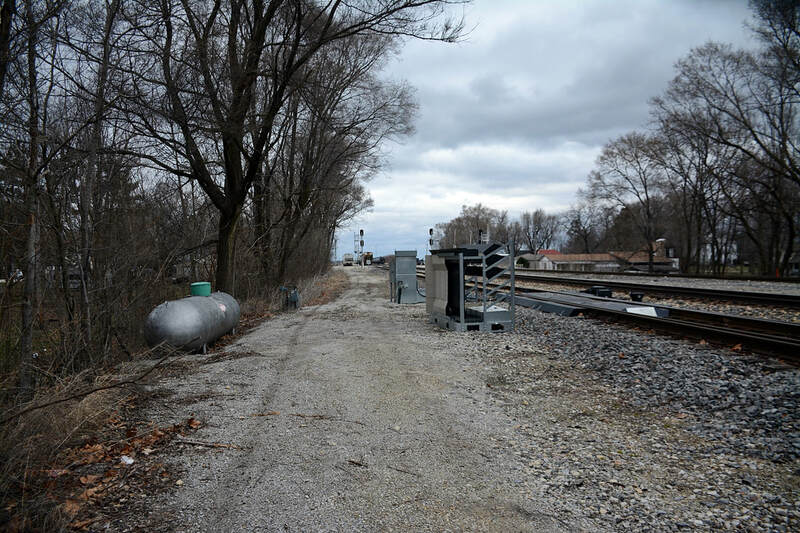 As you can clearly see, the additional mainline tracks were on the east side, but after two signal projects in the area, its not as easy to see. 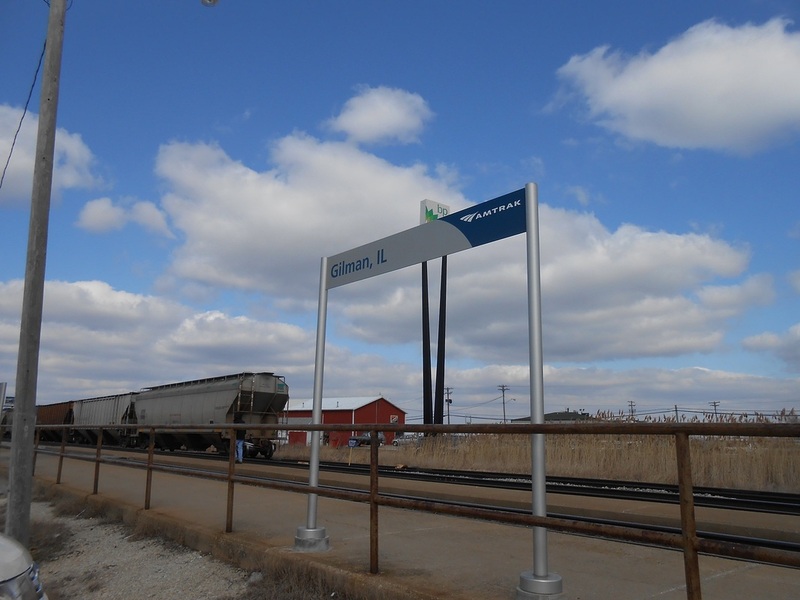 The first redo of Gilman involve replacing the gantries with wayside Safetran LED signals that were more visible and easier to maintain. The only remaining part of the old gantries was half of the eastern support for the southern surviving gantry. 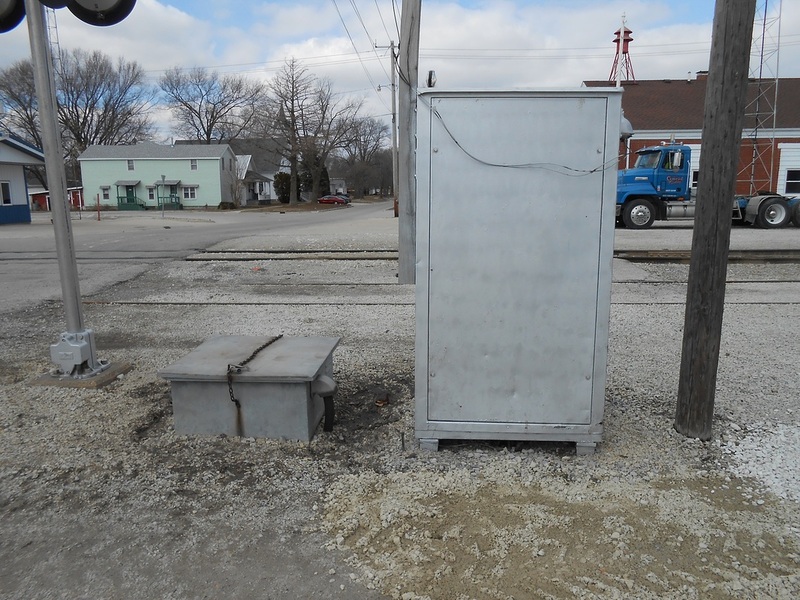 This was used to support cable that went to the signal from the relay cabinet. 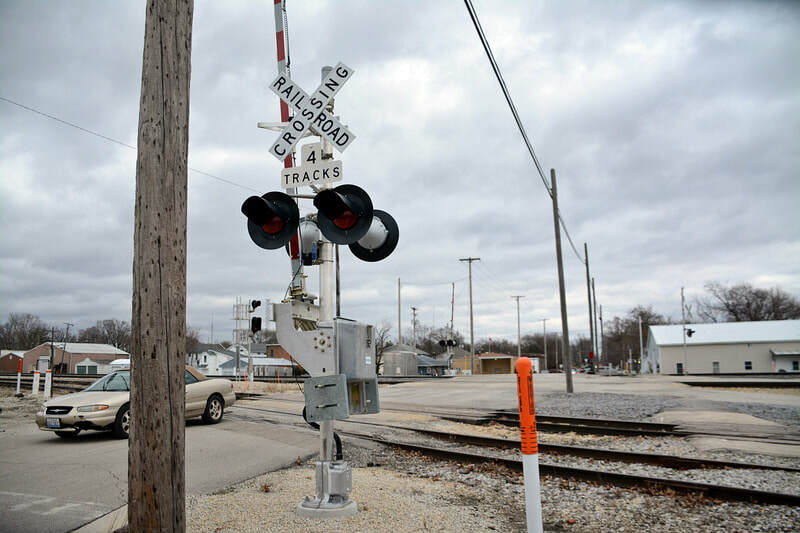 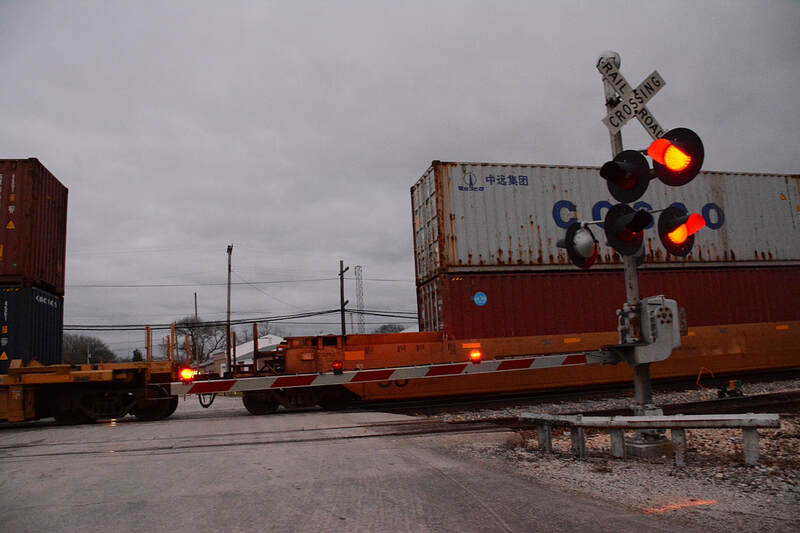 The second redo replaced these relays with new controllers and included new cable runs and railroad crossings. 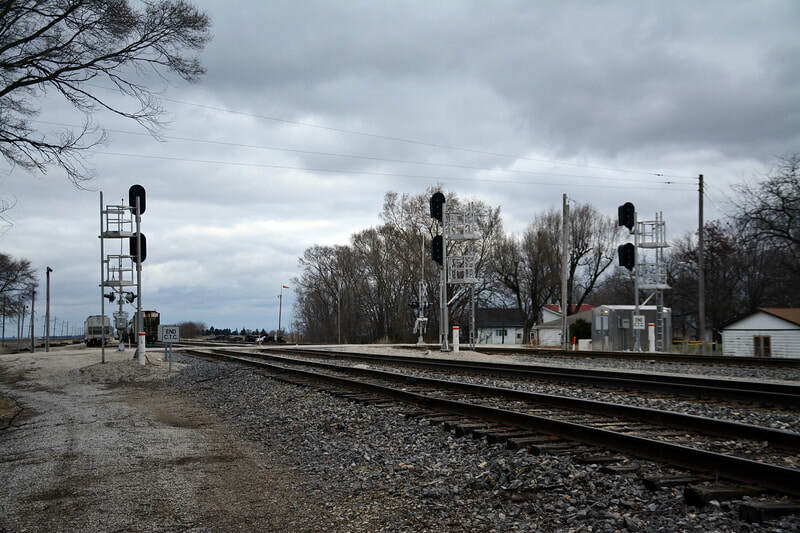 The signals were compacted and moved to locations chosen by CN rather than mimicking what the IC has done with the gantries The dwarf signal had survived up until this point. During the second redo, the dwarfs were replaced with full-sized two-head signals that only show the red aspect... and you may ask what is the importance of that? 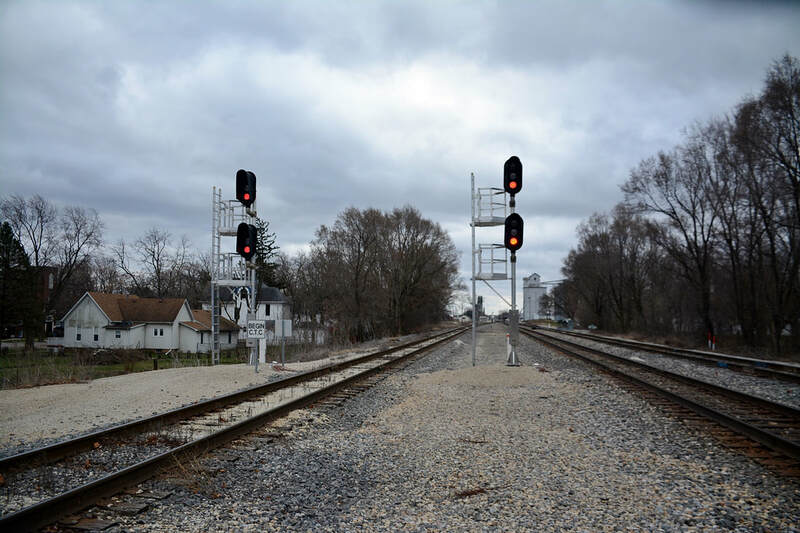 CN used a flashing red aspect for its restricting indication. This means now the flashing red light was imposed upon Gilman. Below are images of the current installation. 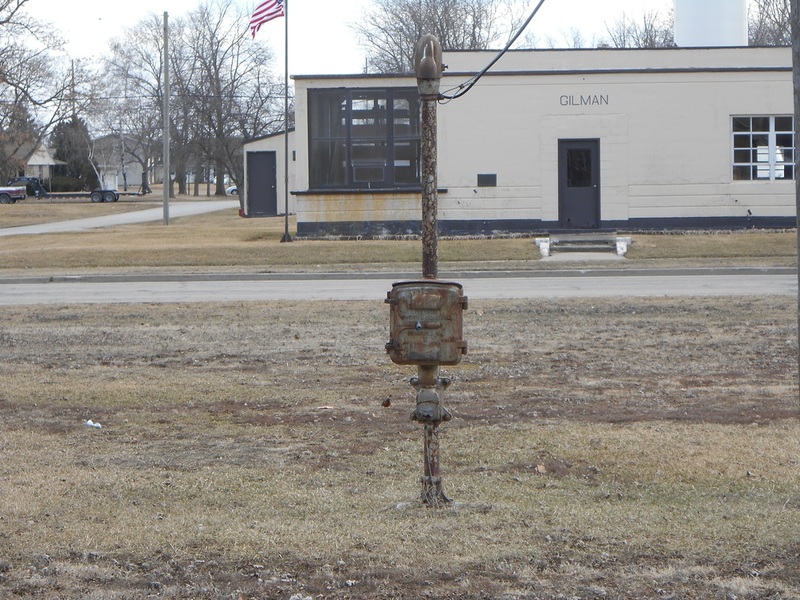 All that said, you can still find old telegraph communication lines in the backyards of residents. 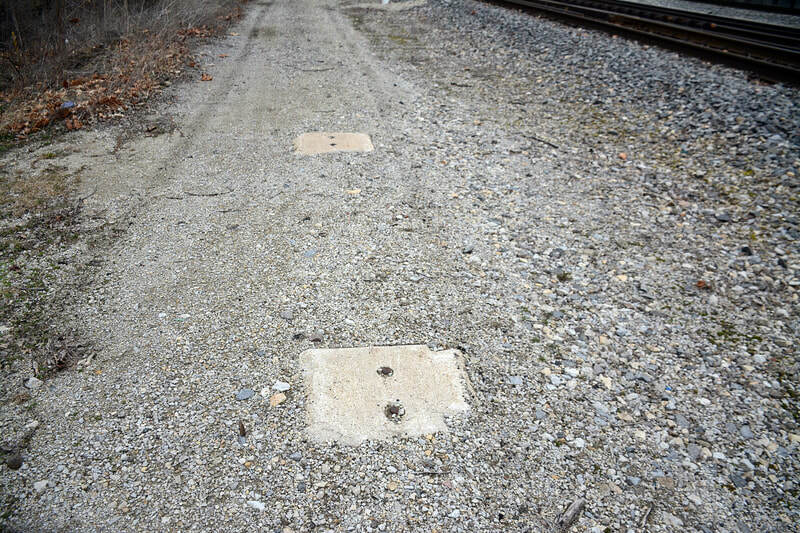 No longer carrying the important information from tower to tower, now showing the way infrastructure may endure its useful periods and become relics of the past. 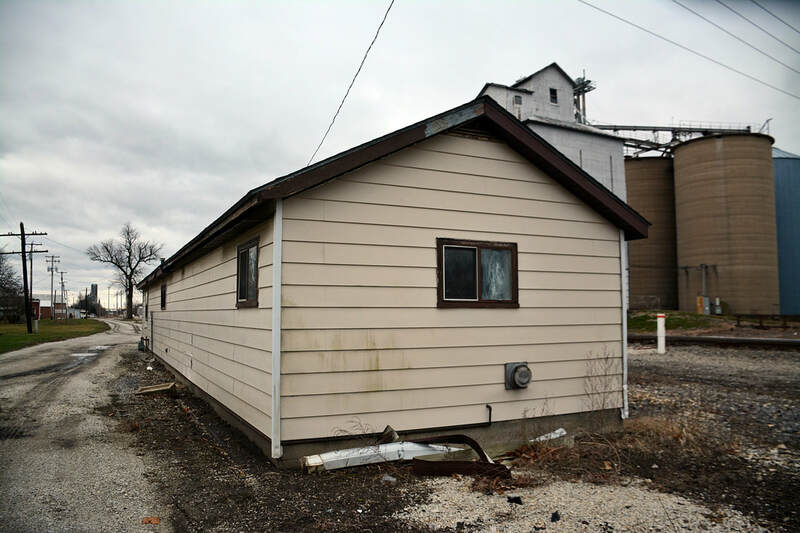 CTC control was done in the pictured yellow/tan building, this is now used as a storage shed. 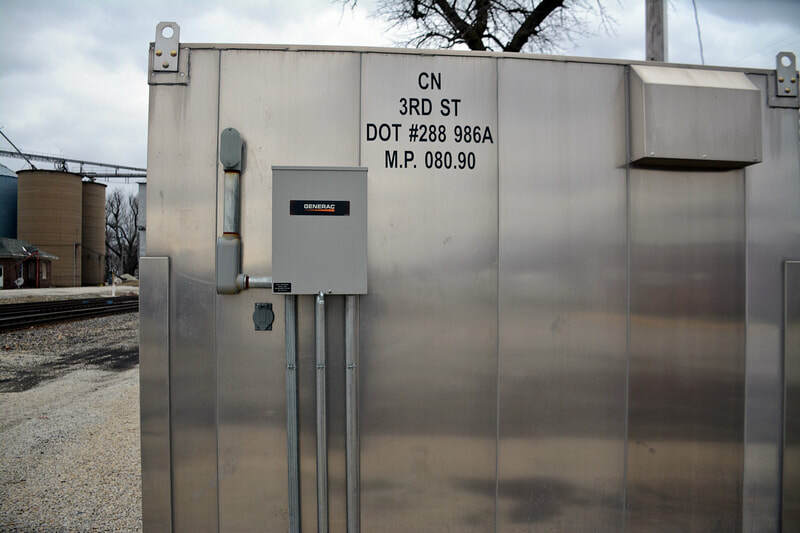 CTC is now remote from Homewood control. I forget where the panel went, I remember seeing someone somewhere had it. These above were all taken at the B street crossing. 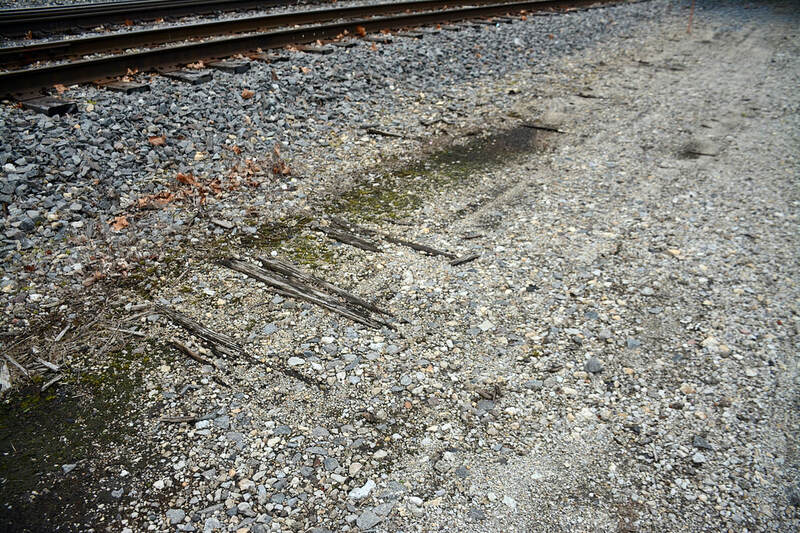 You can tell where the tracks ran. 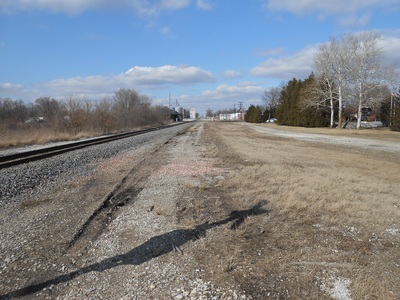 The ICRR maintained a 3 track presence typically and the evidence is held by a large RoW today. This area is a single-track main, but a siding appears shortly to allow passing south of Gilman. 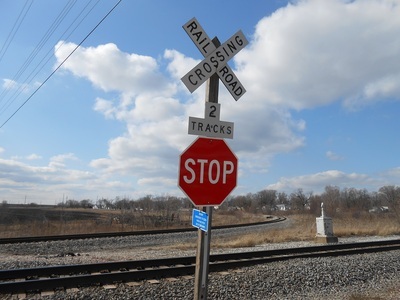 The yard and junction are north of the diamonds, and a wye is created using TP&W shared trackage south of the diamonds which connects into the Gilman Subdivision. 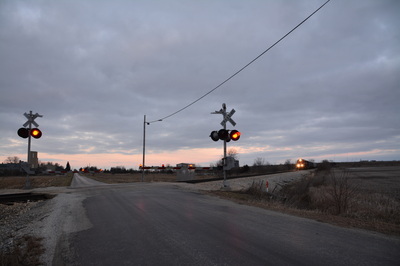 The other ones above were taken throughout the junction area. 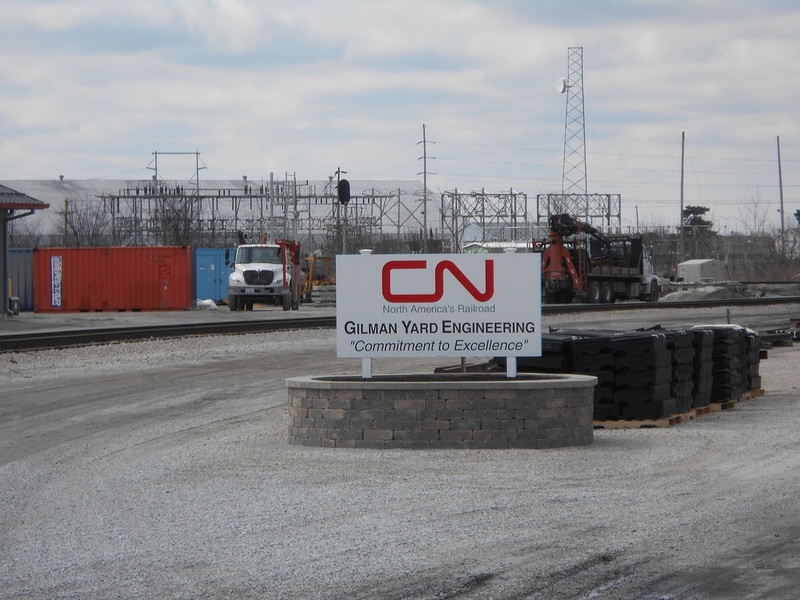 North of Gilman is the yard itself. 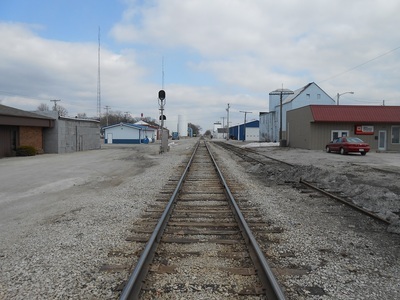 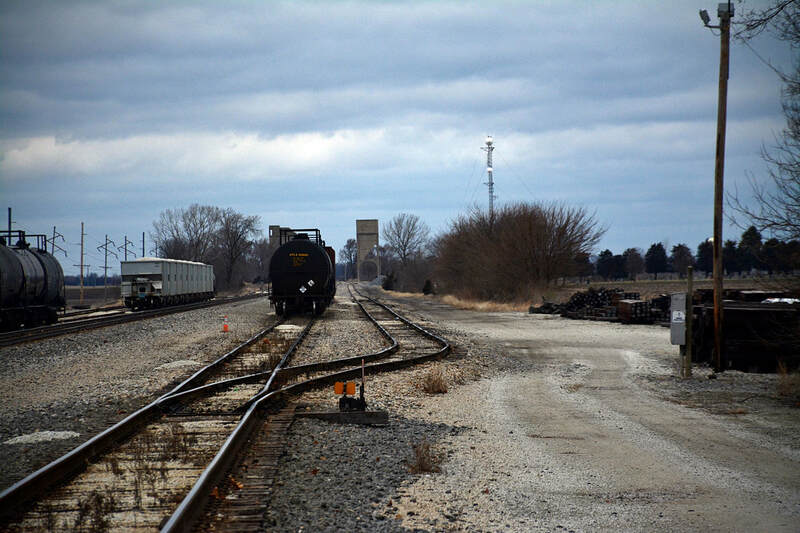 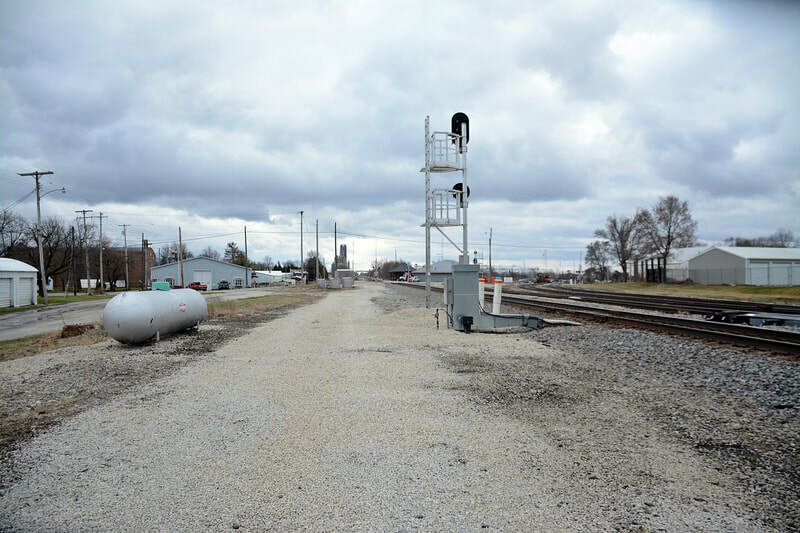 The lead funnels down into a double track presence that comes back out to two tracks that run onto the TP&W and to the Gilman Subdivision that runs to the Norfolk Southern at Gibson City, IL. 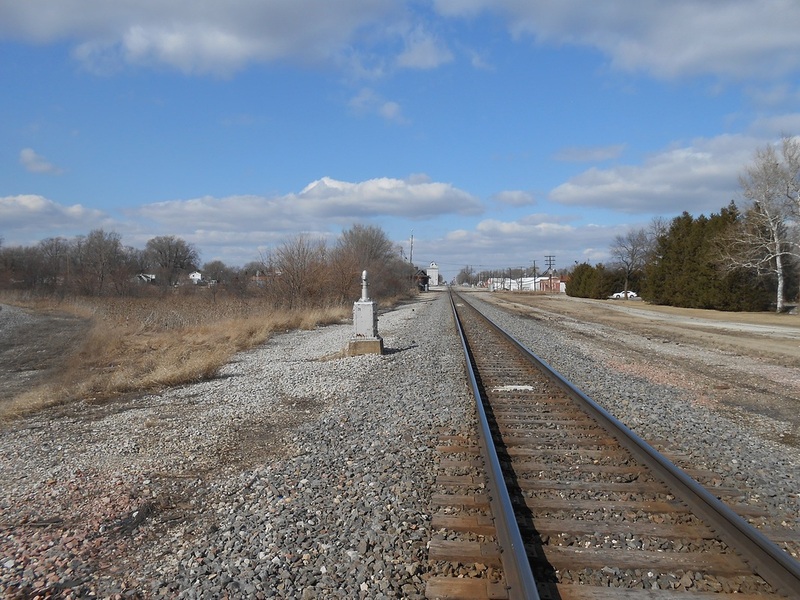 There are tracks missing, however, as there used to be three tracks diverging to the southwest, instead of two. Also there are auxiliary tracks missing, as you can see I found the ties buried from one of them, that ran along to the grain elevator. 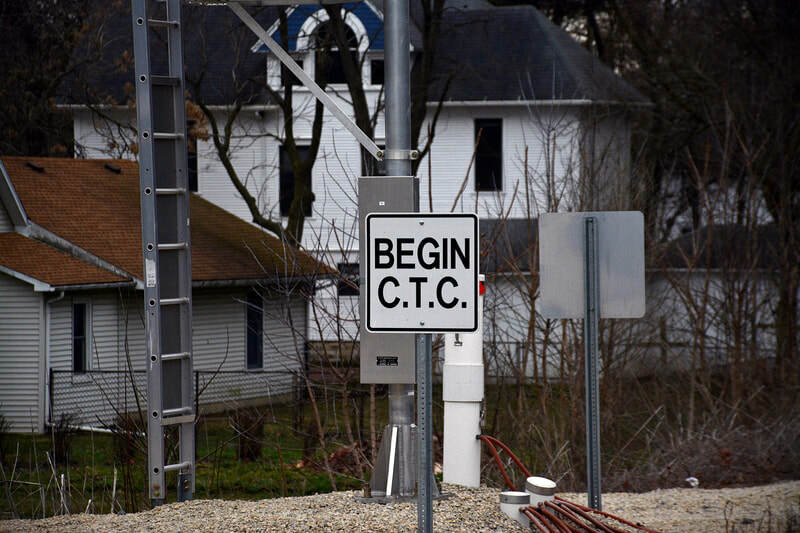 The junction is CTC controlled, so you will notice there are "Being C.T.C." 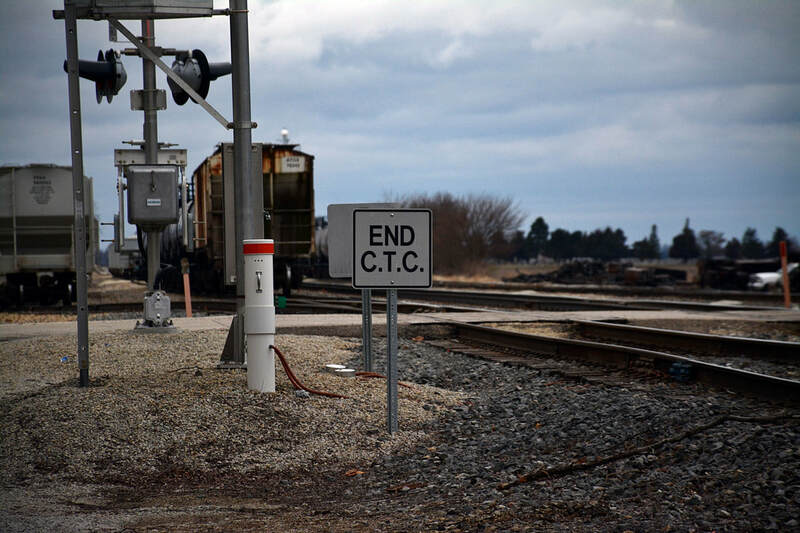 and "End C.T.C." 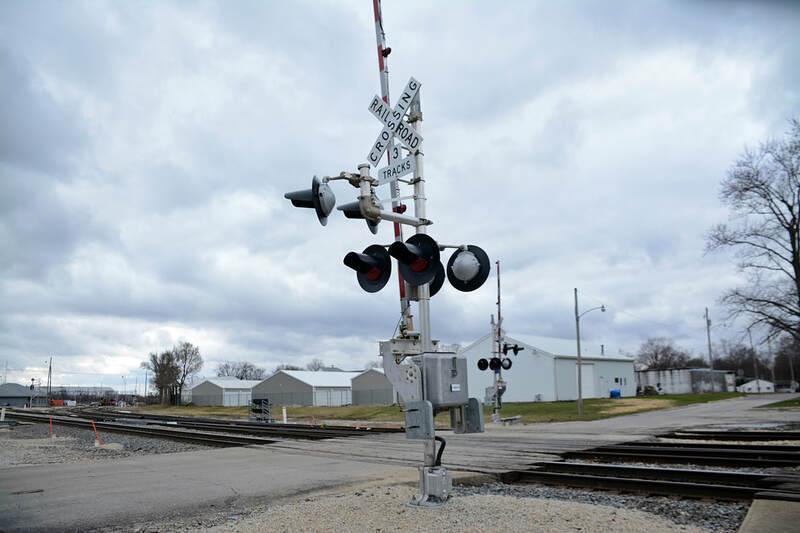 as you come through the junction limits. 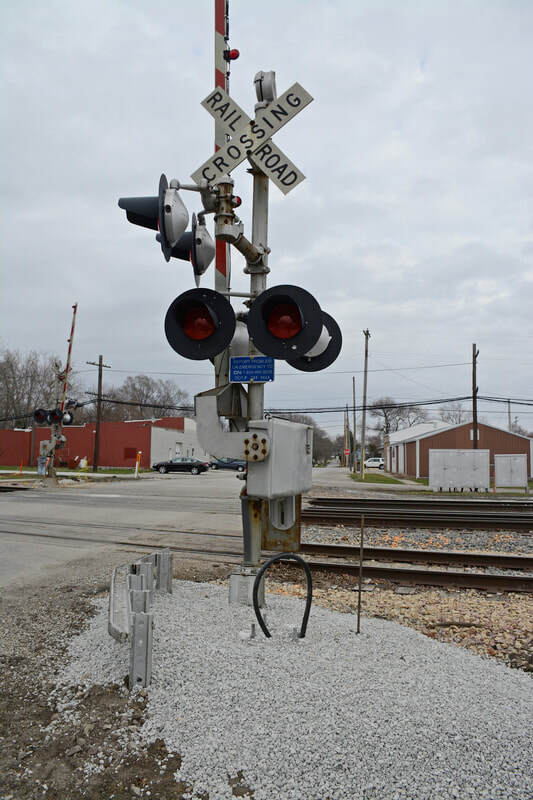 The majority of the mainline is automatic block signaling. 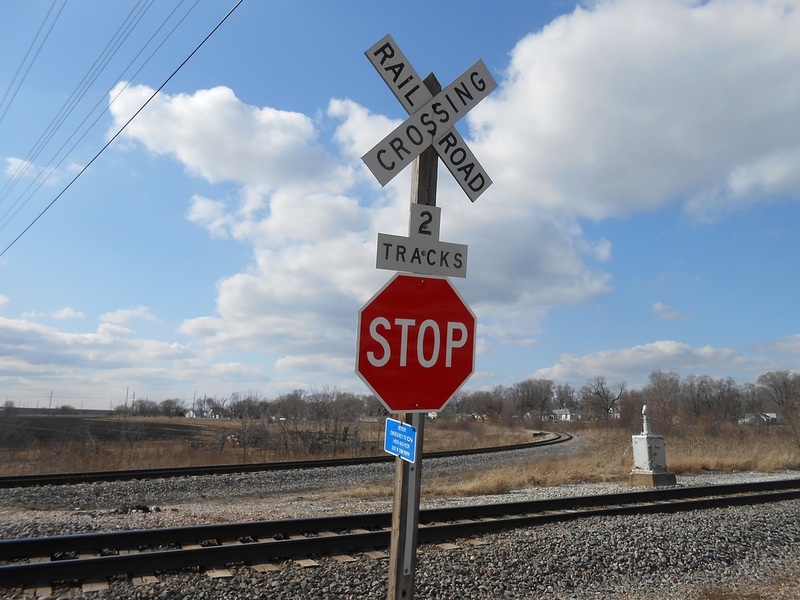 (ABS) Junctions being CTC controlled against the norm justify the signage. 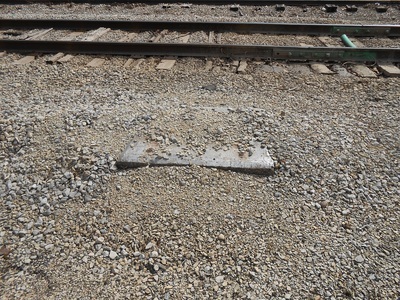 Originally passengers were taken care of at the depot that remains on the northwest corner of the diamond. 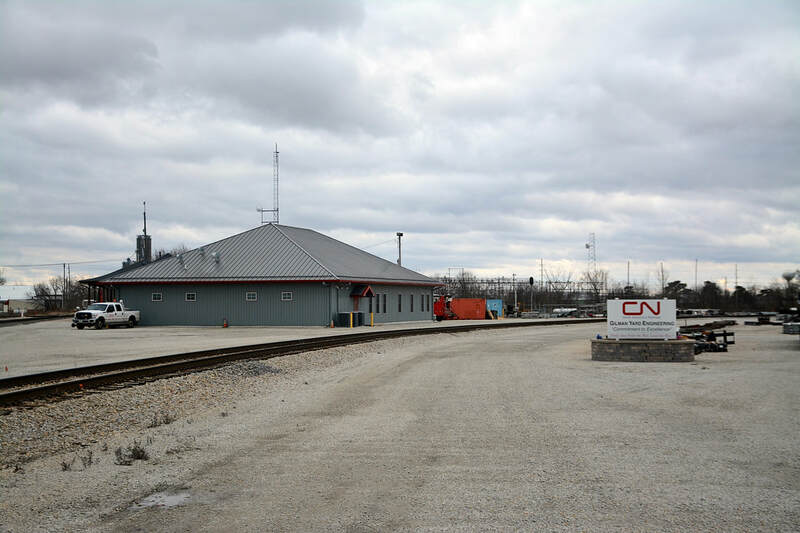 Now that that is the CN Engineering Department building, this was built to offer the service to passengers. In Gilman, the railroad reclaimed the depot from passengers and there was a small shelter purpose-built for Amtrak. This is just north of US-24 grade crossing. 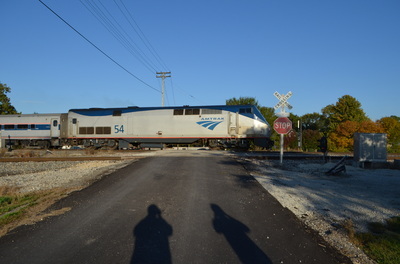 Amtrak trains 58 and 59 "City of New Orleans" service trains do not stop in Gilman. 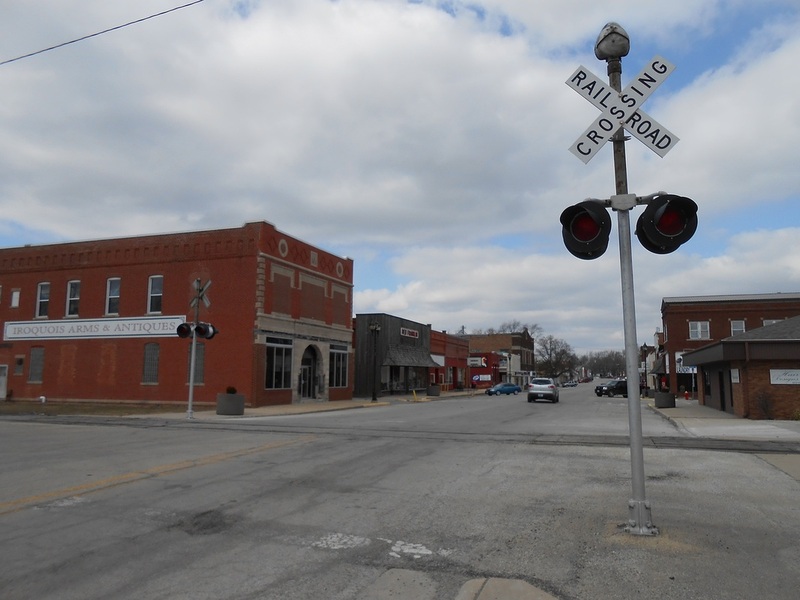 Central street is the crossing that catches the most attention. It sports a US&S teardrop bell from the early days of its installation. The crossings here are gateless for the most part, and the traffic is very light. This is just to the east of the junction. TP&W used to maintain three tracks in Gilman, only one crossed the Illinois Central, however. 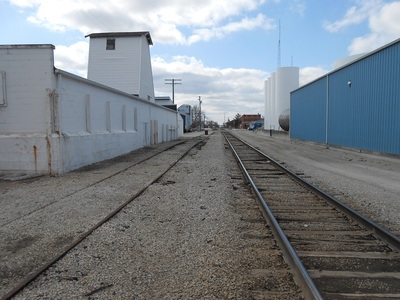 The other two stubbed off before the diamonds, leading to trackside industries such as a freight house. 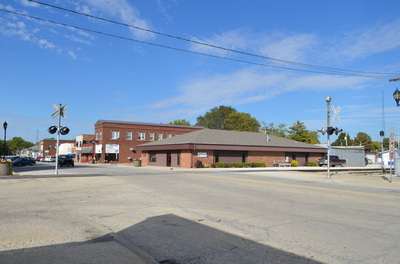 Similar to the rest, but with a different bell. 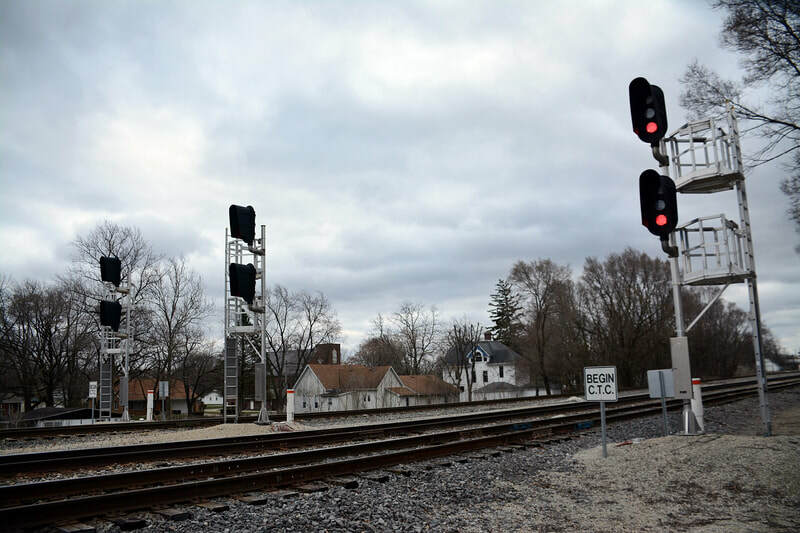 The TP&W signals are controlled by the Canadian National railroad who oversees the junction in Gilman. 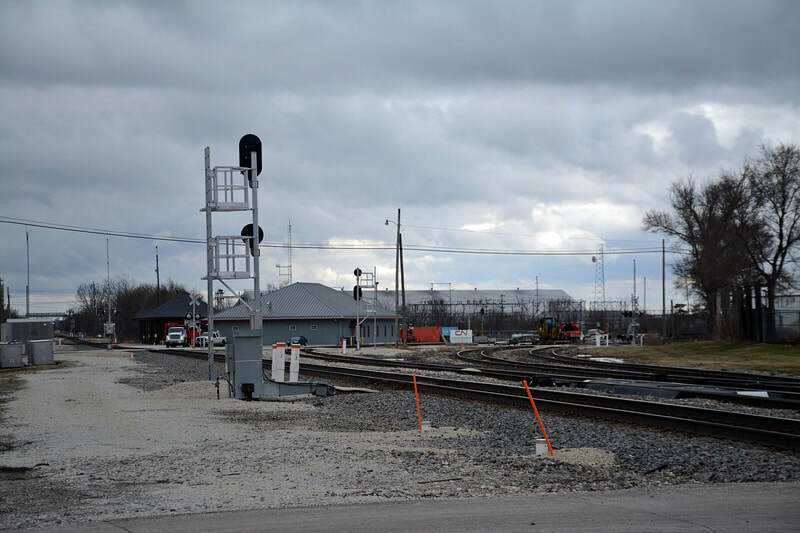 The signals include two approach signals on each end of the town with a CN-controlled home signal on either side. These signals have since be replaced. 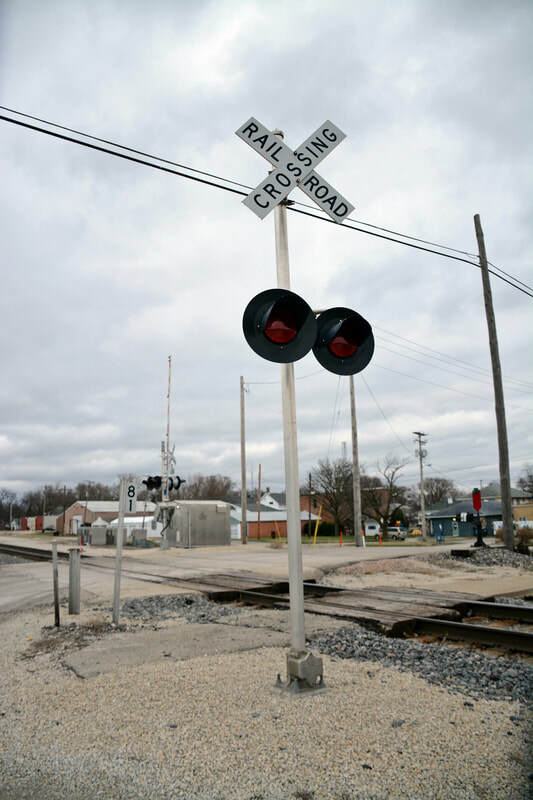 The new signal stands on the western side of Central Street, closer to the junction. 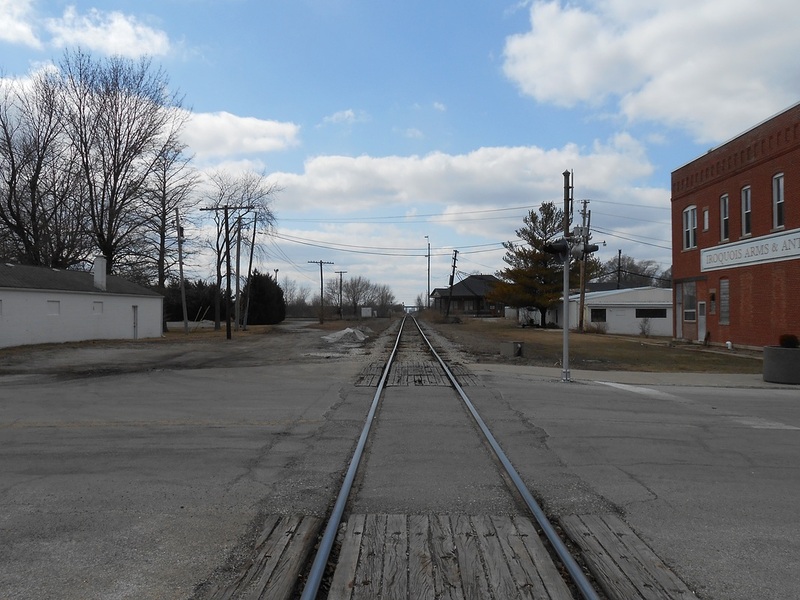 The last photo reflects this. 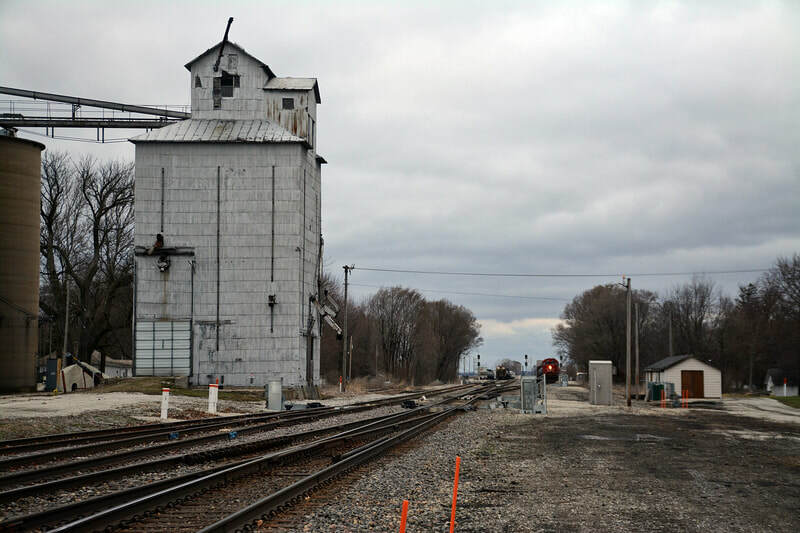 Likely one of the original elevators in Gilman, IL - this industry is part of a chain of elevators owned along the CN line by Ludlow Co-Op out of Ludlow, IL. 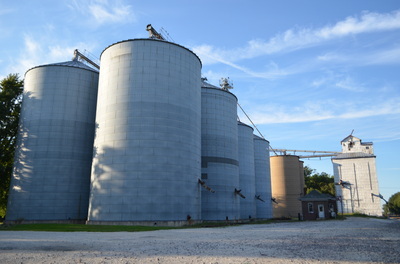 This one features the original elevator with concrete expansion silos and a larger set of metal silos. 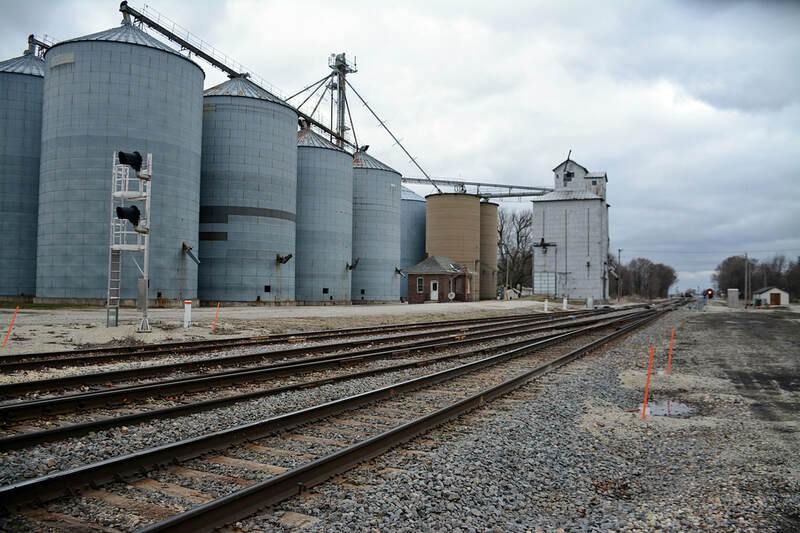 It seems to be dead most times I visit but of course is busy during harvest time. 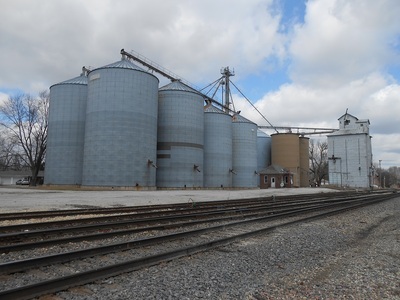 As time would have it, this facility was demolished in 2018. 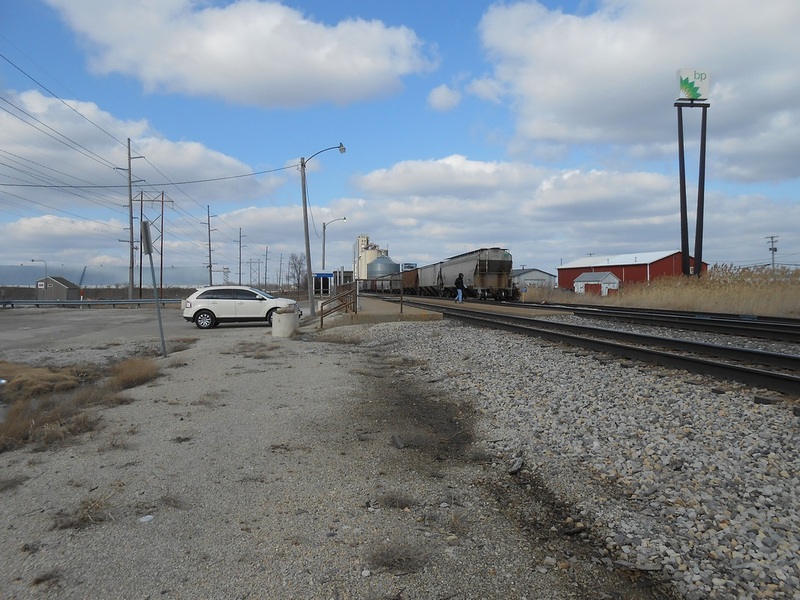 Now an empty lot, the future of this site remains unknown, currently used for random storage and parking as felt needed. 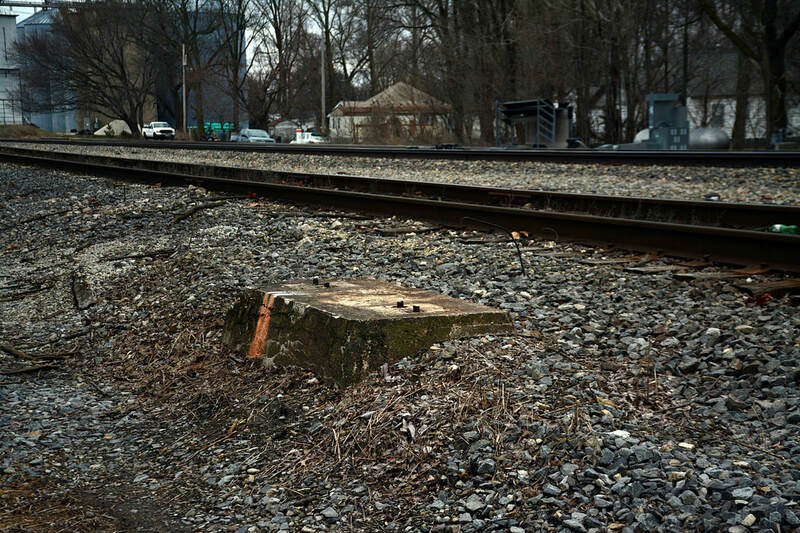 This article is incomplete... have something to add? 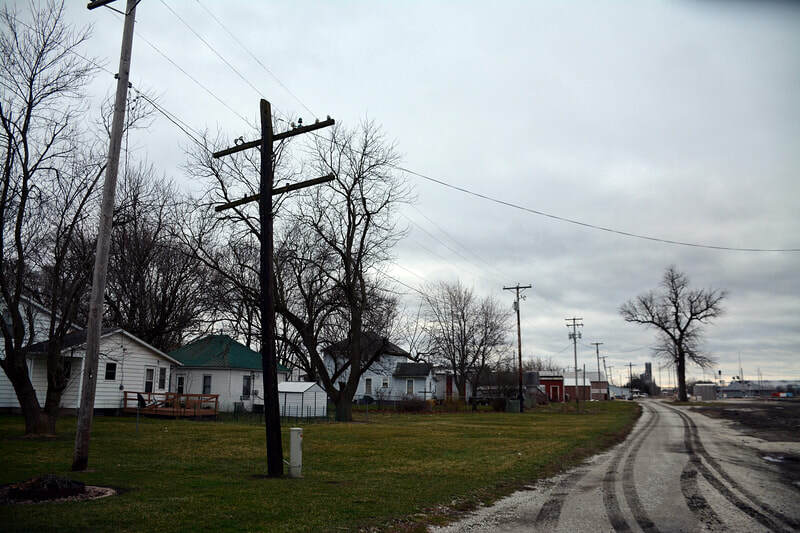 Visit the Submissions page today!